The river is high again this Christmas-time, after a lot of recent rain, but (touch wood) it’s nothing like as bad as 2015, and hopefully everyone will enjoy a safe festive season! 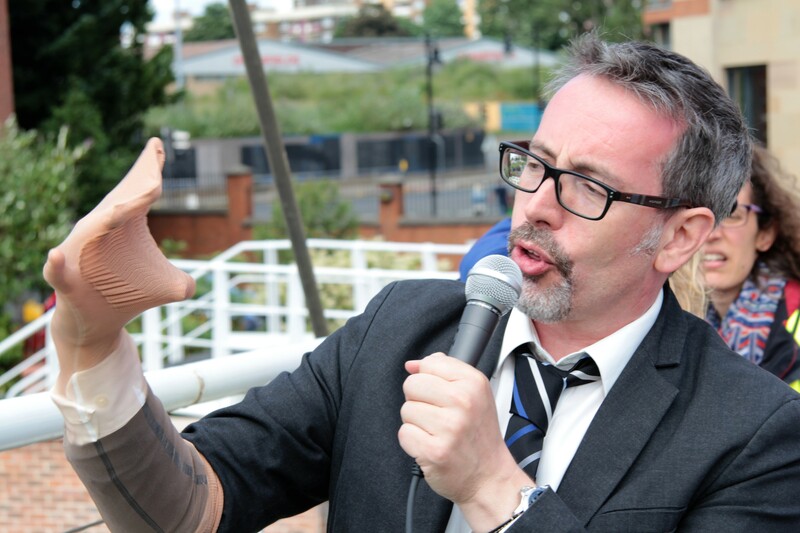 Here I am, in fact, holding up the figure that represents “Lynda” — although frankly it looks nothing like her (I had to work with the dolls I was given…). You can just about see “her” enlarged on the screen behind me. Meanwhile my voice was amplified for the Whitworth Hall (where they normally hold graduation ceremonies, etc.) by a radio mic. 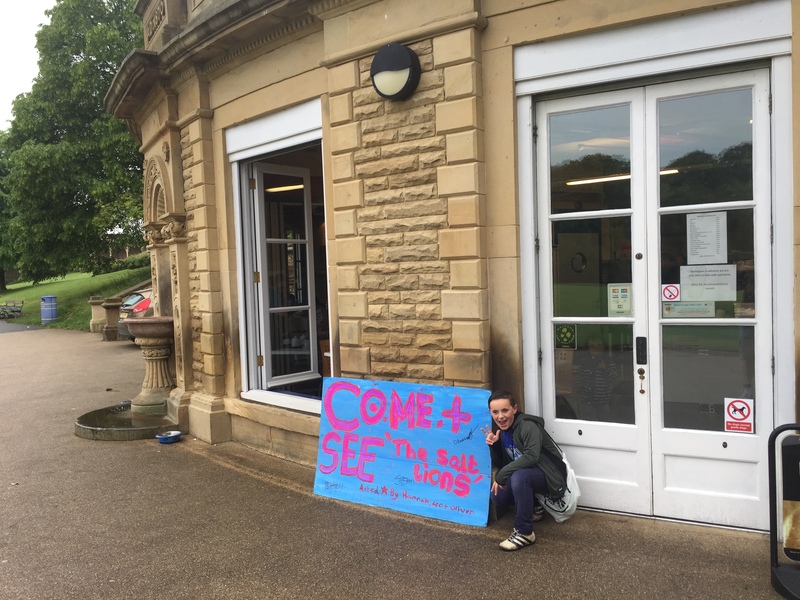 In case you’re wondering how this piece about Shipley went over with a bunch of Manchester University employees who mostly don’t know the place, it turns out the answer is: very well! The Green Impact staff sent an email questionnaire about the awards event out to everyone who attended it (142 people, apparently), and got 72 completed responses… which is a pretty good return, as these things go. Of these, a very pleasing 73.6% (i.e. 53 people) rated TMOW as a 5* performance — with another 12.5% (9 people) rating it 4*. Since nobody in the audience had actually asked to sit through this, this is excellent feedback. 🙂 In fact in the same questionnaire, 44 of the 72 said that TMOW was their favourite thing about the whole event (which was generally considered well organised, well catered, etc.). I’m sharing this info in the interests of full documentation, and of course in the spirit of self-congratulation… Joking aside, though, what’s important here is that these very personal flood stories — as they were experienced by Lynda and others — can still capture people’s attention and empathy, three years after the fact. And so this is Christmas. 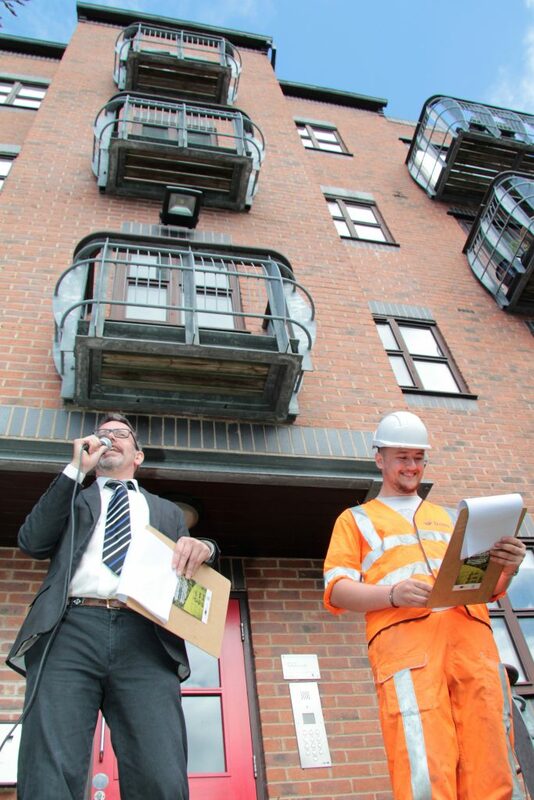 Another year over, and a quiet one for Multi-Story Water, as we’ve mainly been working on other things. But watch this space, as we’ll be back in action in the New Year. OK. So where to begin? Maybe that’s too far back. 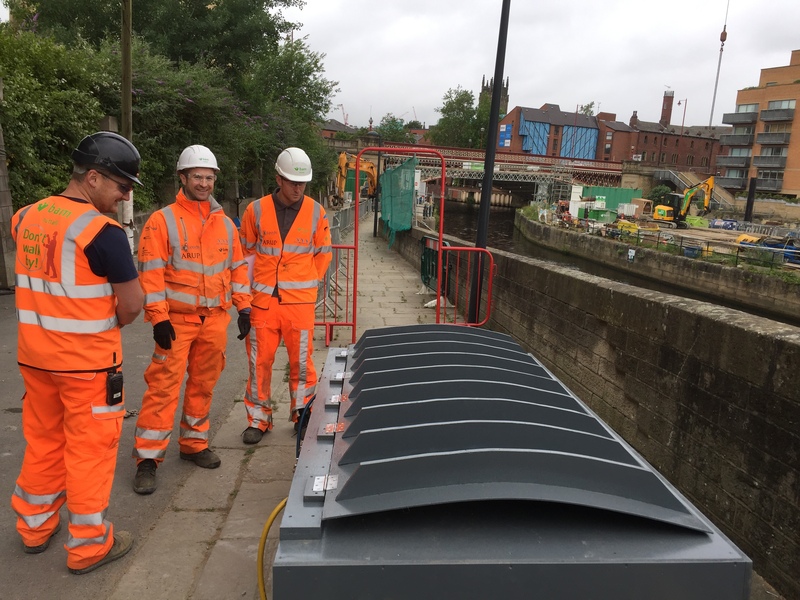 Maybe I should begin in the 1770s, when the first sections of the Leeds to Liverpool canal were cut — through Shipley and Bingley — the first stage in a process that would connect Leeds, Bradford and Liverpool by water, and catalyse those cities’ rapid expansion during the Industrial Revolution. 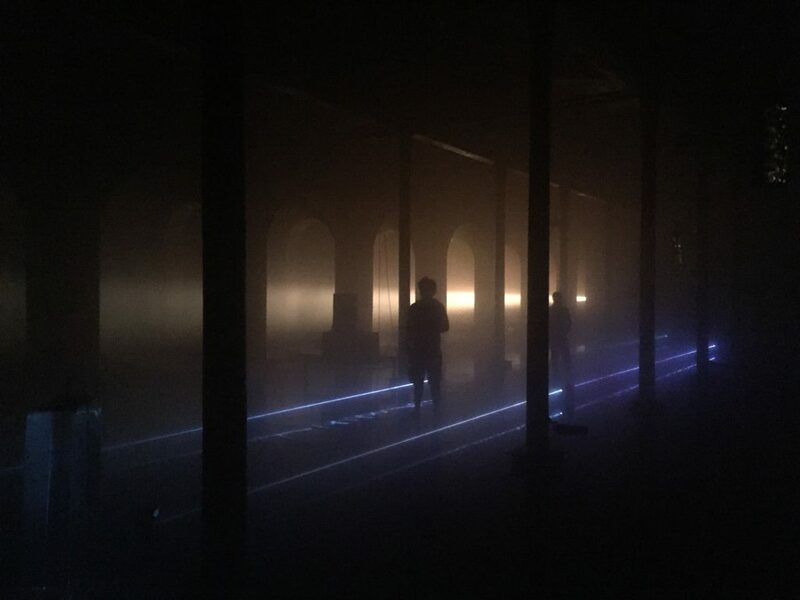 Or maybe I should just begin last month, when the Leeds-based arts collective Invisible Flock (with whom I have enjoyed some productive dialogues over recent years) invited me to attend the launch evening of their new, Liverpool-based installation, Aurora. 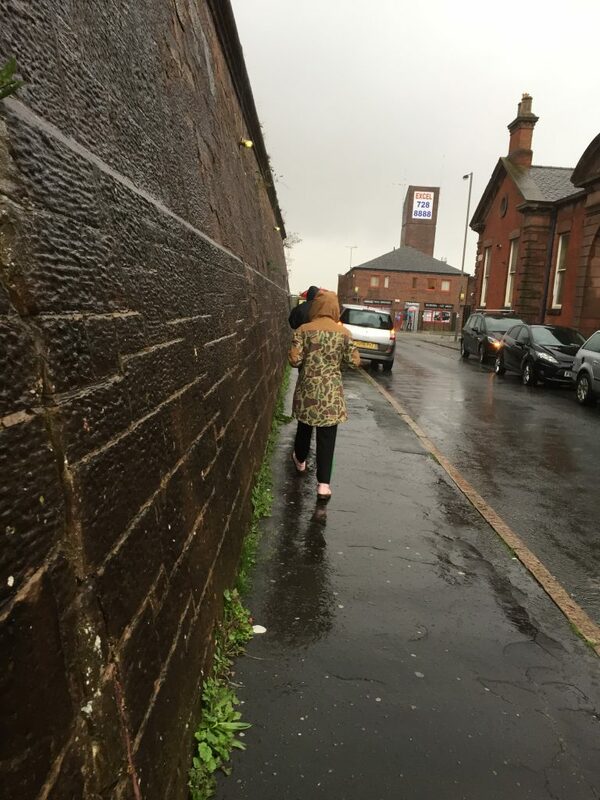 Which is why, last night, I found myself walking through pouring rain in the Toxteth area of Liverpool, along with other intrepid visitors to Aurora‘s very first public showing. Everyone was cold and damp, and we’d been warned that we were likely to stay cold and damp, because we were about to step inside a reservoir. 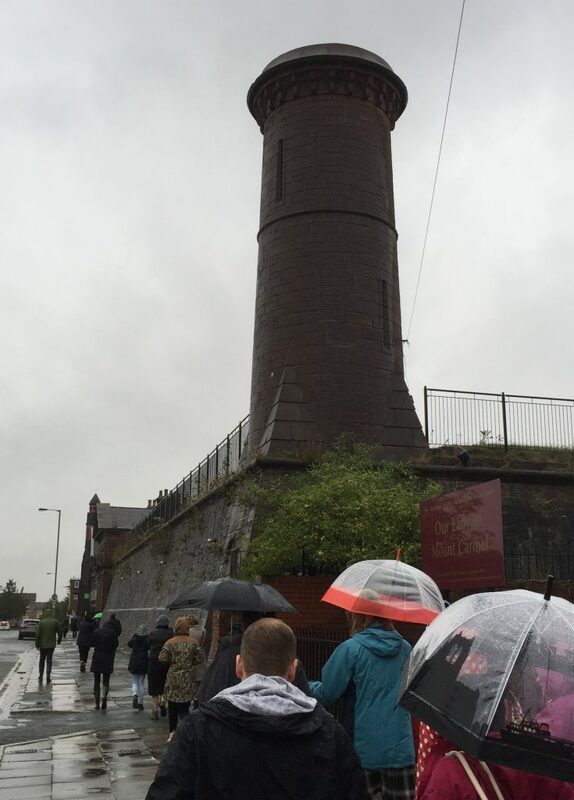 Toxteth Reservoir, that is: a remarkable, Grade-2 listed building that is part of Liverpool’s industrial heritage. 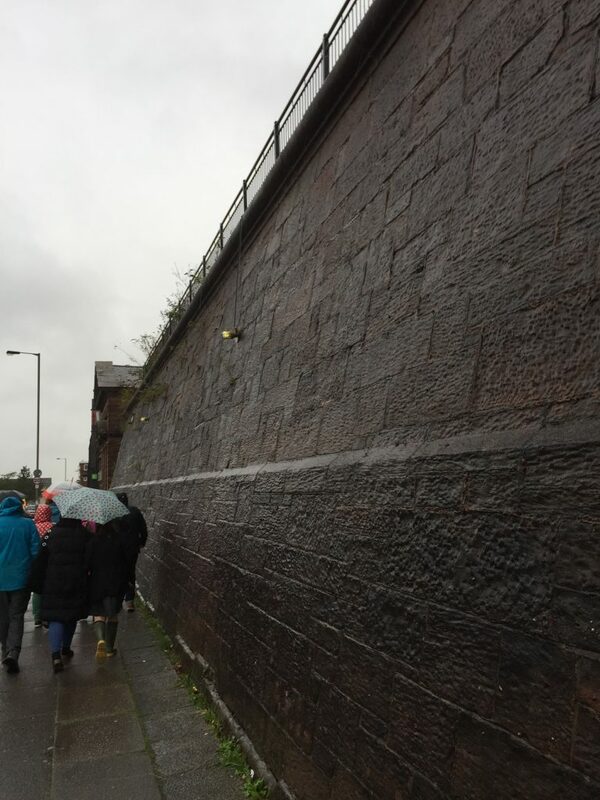 Those forbidding, sloping walls, built around 1845, were designed to contain and support vast quantities of water. This water, which presumably fell from the sky to begin with? 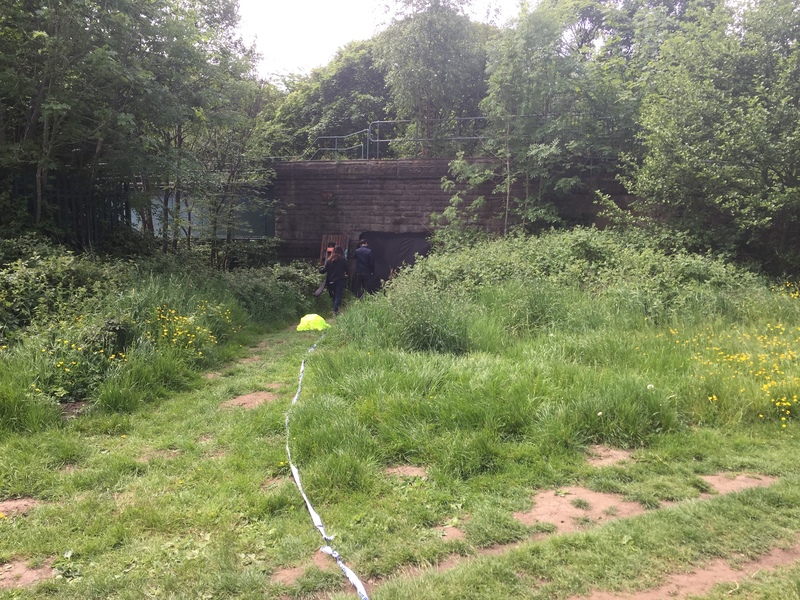 — this being Liverpool — was held in a rectangular tank measuring around 2600 square metres. It was distributed as needed to provide clean water to the city’s rapidly expanding population, and also supplied early fire-fighting efforts, etc. The roof of this vast space is held up with rows of iron pillars. 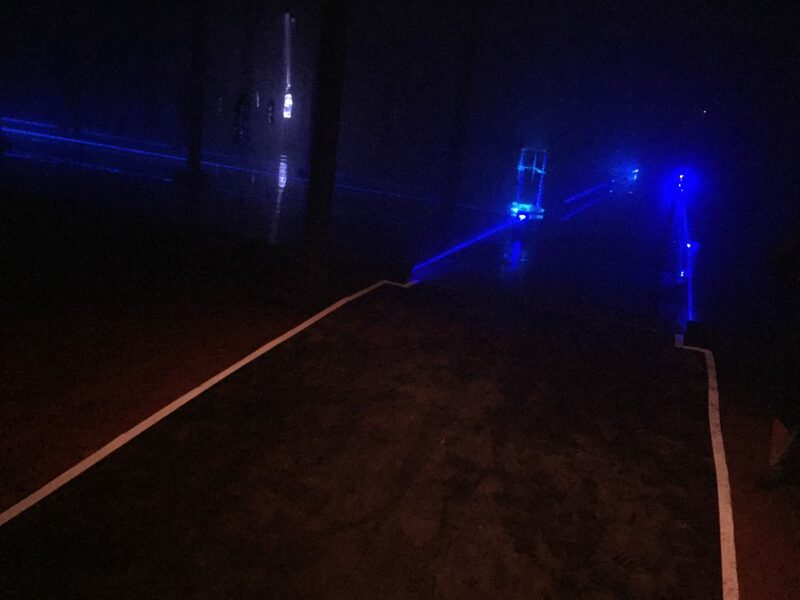 Moving inside the building, we found ourselves navigating our way freely around a big rectangle of walkways, shadowing the interior edges of the building, which were marked out by coloured lasers. 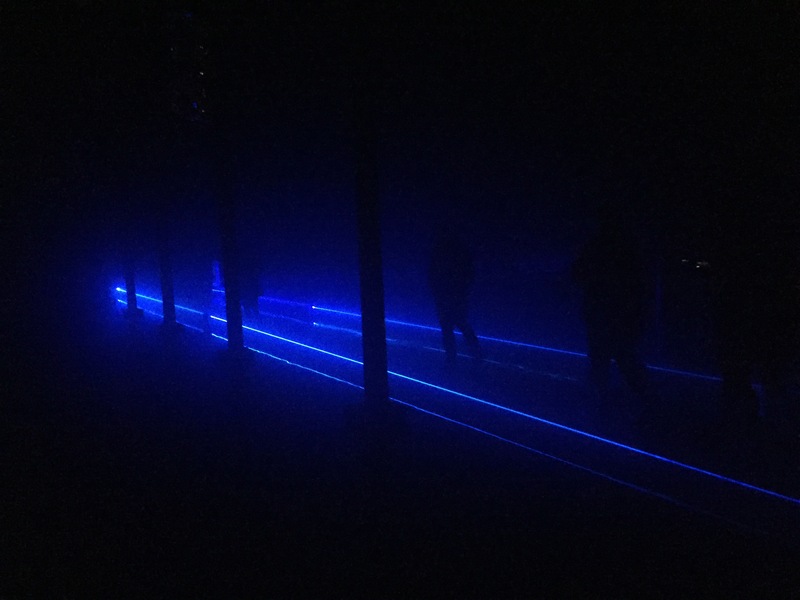 These walkways were all under 2 or 3 centimetres of water, so as we walked, patterns of coloured light rippled out in front of us. 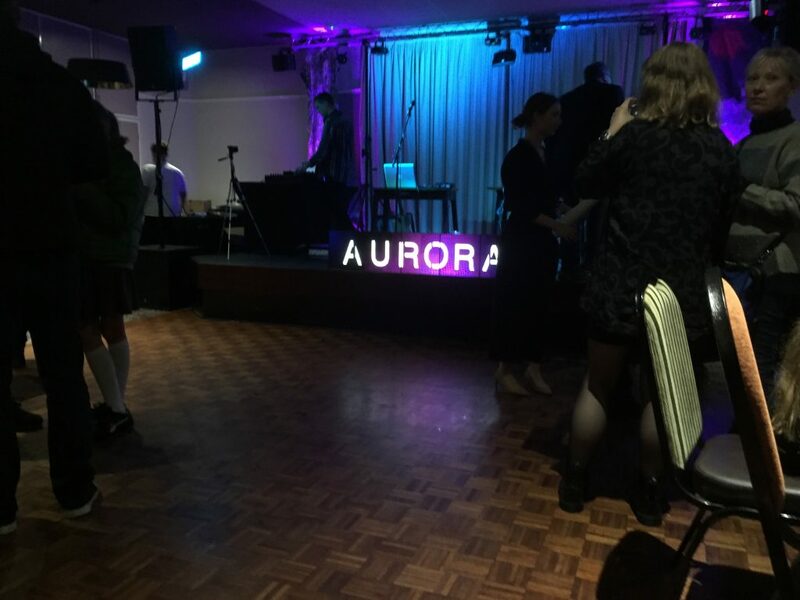 I went into Aurora not really knowing what to expect. 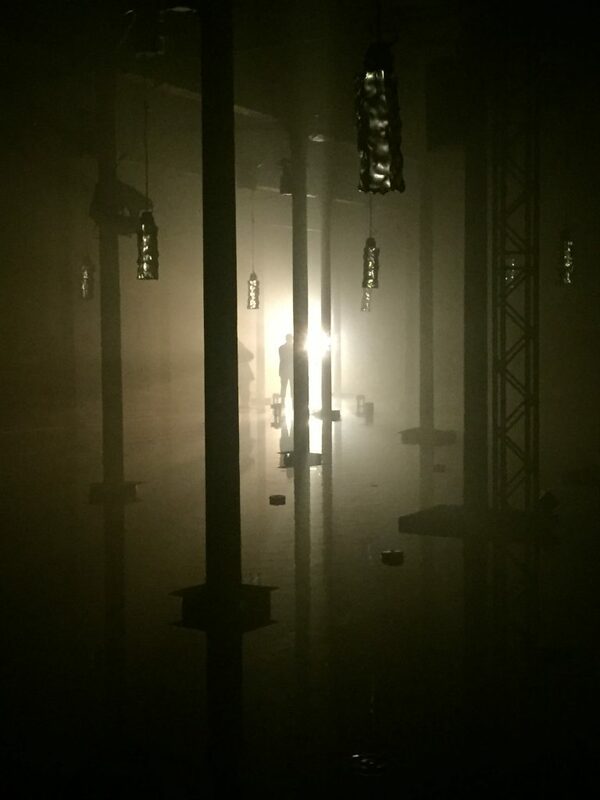 The last piece of Invisible Flock’s that I saw, Control, was a theatre show based on interviews with a myriad of “experts” — which explored who has what degree of control over the way the world is heading just now (politically, environmentally, technologically…). Control was all about the language from these interviews — words, words, words — and so I was expecting that to be continued somehow in Aurora. But instead… no words at all. Just impenetrable darkness, a void without clear edges, and water lapping around our feet, moisture clinging to us in the dank atmosphere. And light. Let there be light, said Invisible Flock. And behold, there was light. 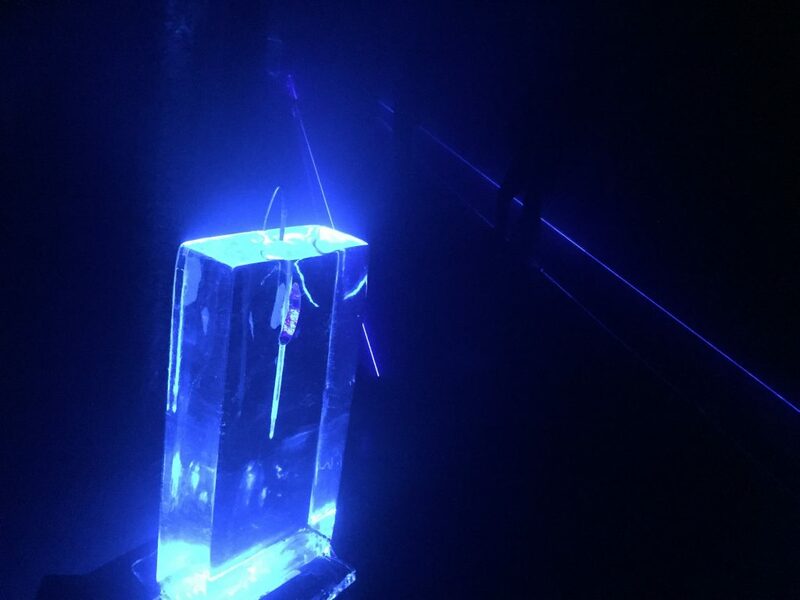 Especially, centrally, light picking out a big lump of slowly melting ice — hanging suspended in the middle of the space, and reflecting in the water below. Sometimes the ice was visible. Sometimes not. As an experience, Aurora runs for about 40 minutes. Which is actually quite a long time when you’re standing in the dark and the cold, watching light play across water. 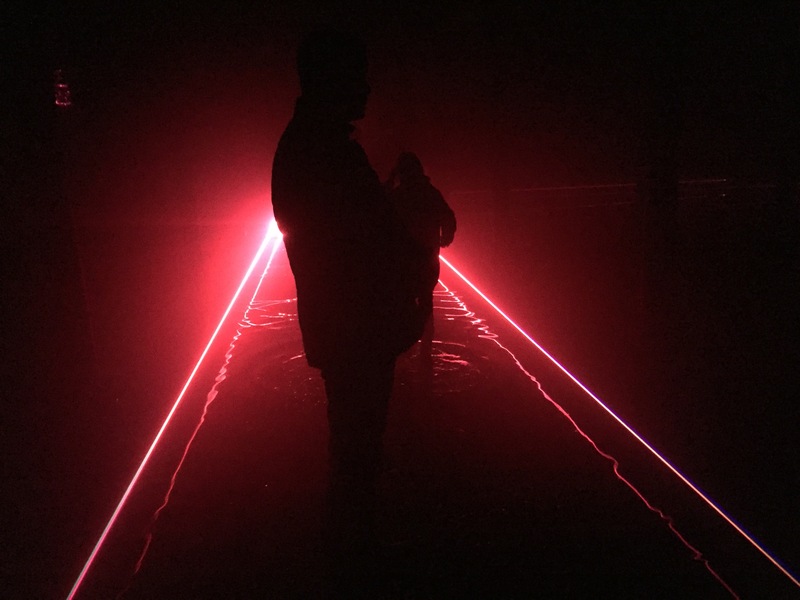 If this were a regular gallery installation, it would be the kind of thing you’d just walk in and out of, when you’ve had enough, but here — like a theatre show — we all entered together and left together at the end. A captive audience. Trapped in the dark. Not quite sure how to get out even if you wanted to. So you’re very much left alone with your own thoughts. Partly because talking would seem, somehow, wrong in here. 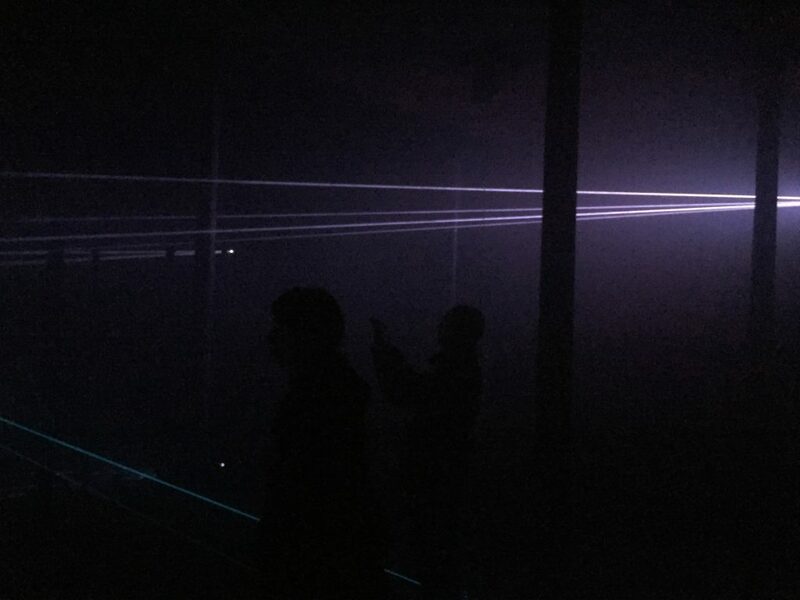 And partly because the sound score — an eerie combination of electronics and strings — is sometimes so loud it would drown out speech. Although it’s also sometimes so quiet that you can hear water dripping. A lot of things run through your head in a situation like this. I went through a phase, for example, of rejection and denial. It’s really just a big son et lumiere display, I thought to myself for a while. Where is the content? I’d read that this was some kind of local community project, so where was the community — other than standing around with me in the dark? 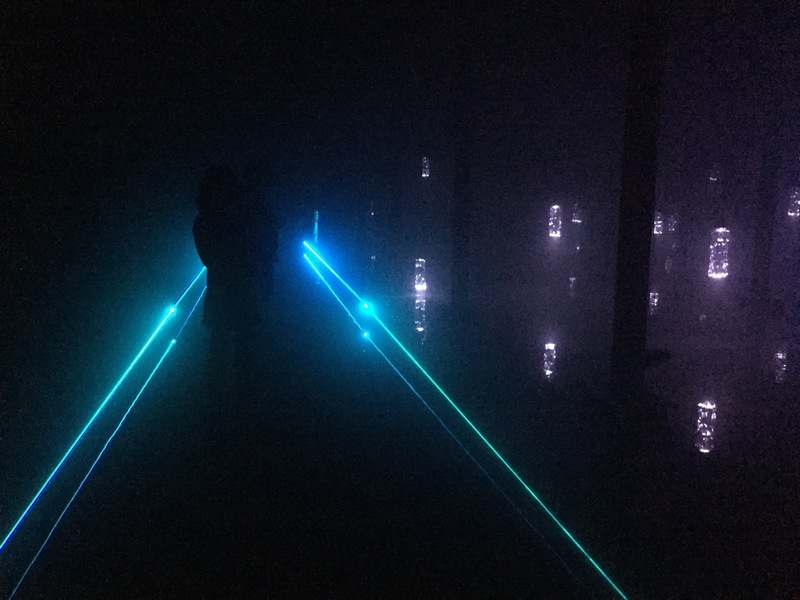 I’d also read that this was to be a piece about global “water issues” like flooding and drought… but how can sound and light alone talk about those concerns? 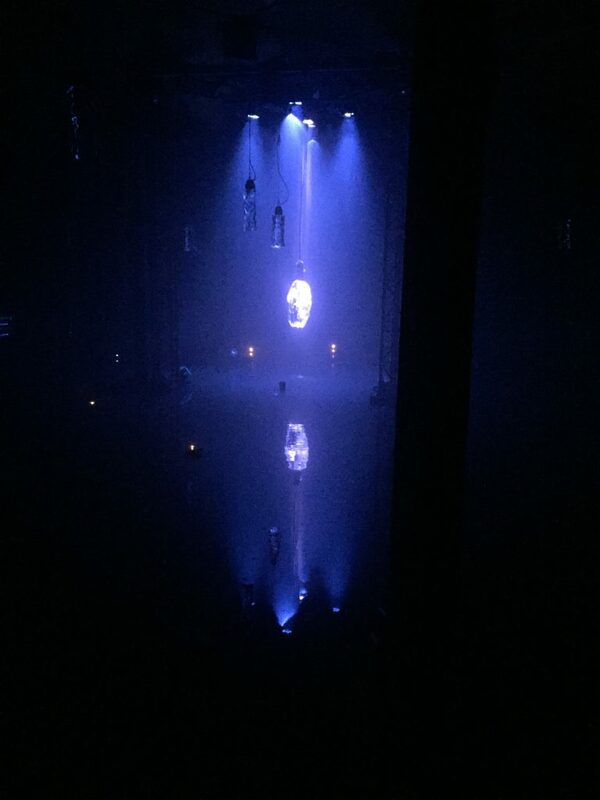 There was a stage in the show when we started to be shown more of the looming, arch-like architecture of the building — and though you can’t really see it in the picture above, it actually starting raining inside the building, around the inside of the exterior wall. 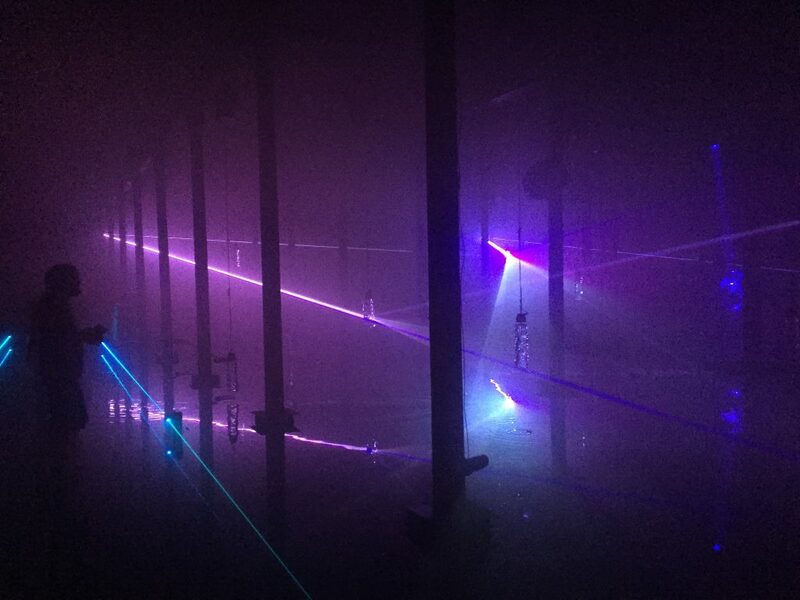 This was the point when the piece felt the most “human” to me — an evocation both of man-made structures and of the weather we all live with in the north of England… the weather that Liverpool’s Victorian workers trudged through, just as we had today. But what was most surprising, and most chilling perhaps, was just how inhuman, or rather nonhuman, Aurora turned out to be. 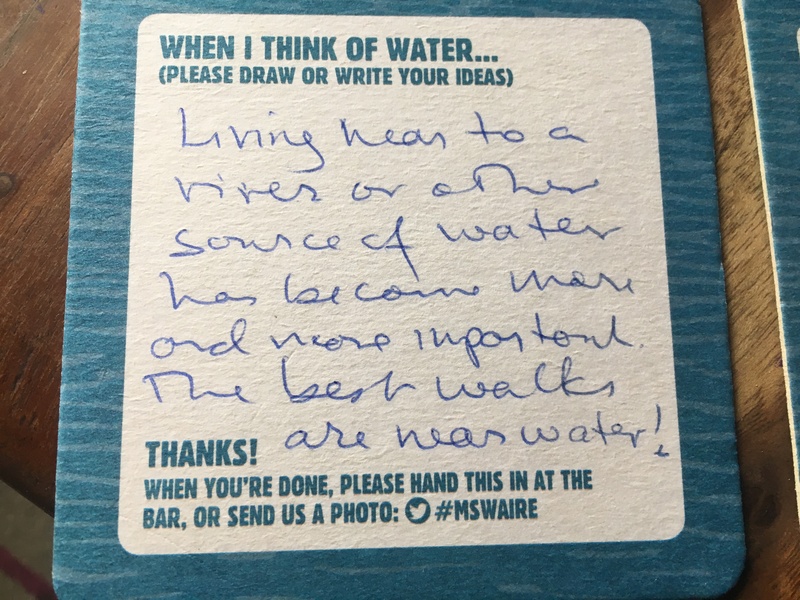 To speak of flooding or drought is to speak, really, of the impacts on humans of there being too much water, or too little, for our accustomed ways of living. But in the end, Aurora seemed to me spectacularly unconcerned with such passing concerns. 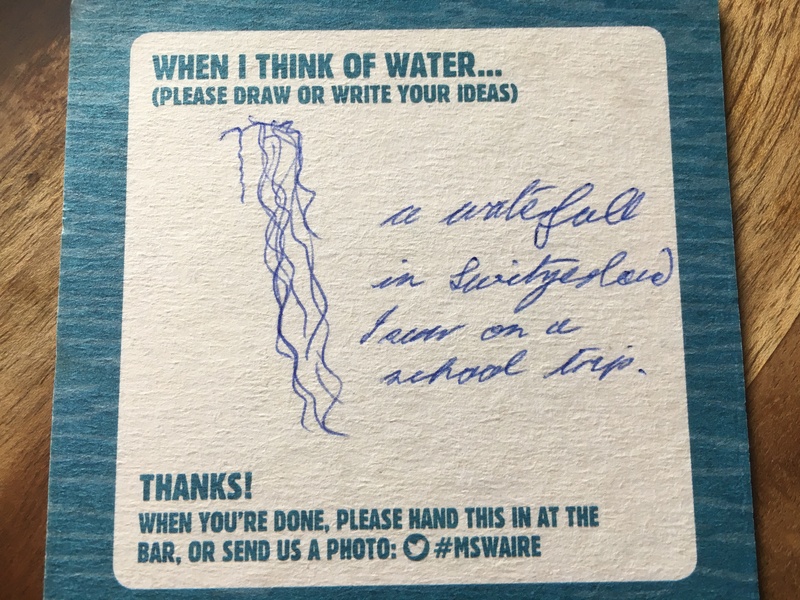 It really was about water as water. 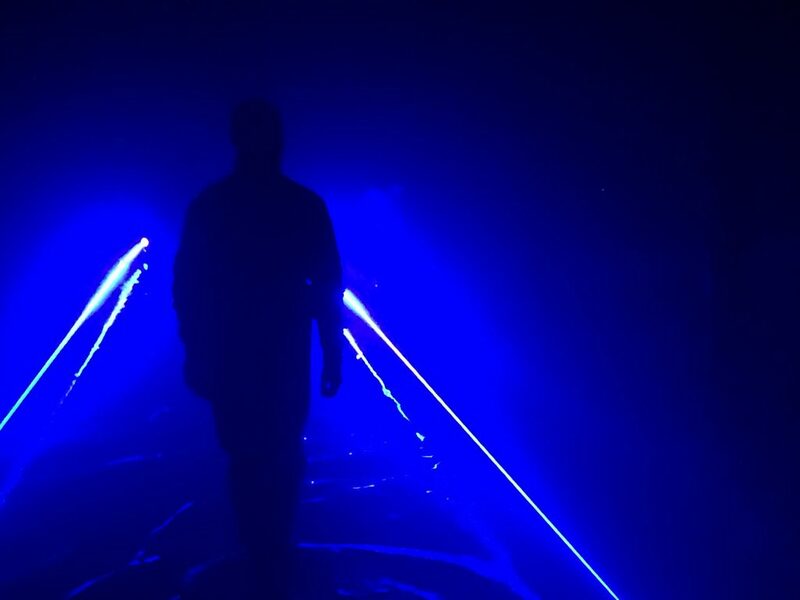 Mysterious. Impenetrable (even when we dive headfirst into it). Eternal. We’re made of it, we depend on it, but it does not need us. For me, this thought was epitomised by the strange, hanging shapes that formed a kind of field, or cloud, or constellation around that central ice block. Shapes that looked at first like lanterns, then maybe water containers of some sort… but also weirdly alien. It crossed my mind, briefly, that they were the eggs of an Alien hive mother… Eventually I realised that they too, like the egg-like form in the centre, were ice. And they were melting. Water going from solid to liquid. 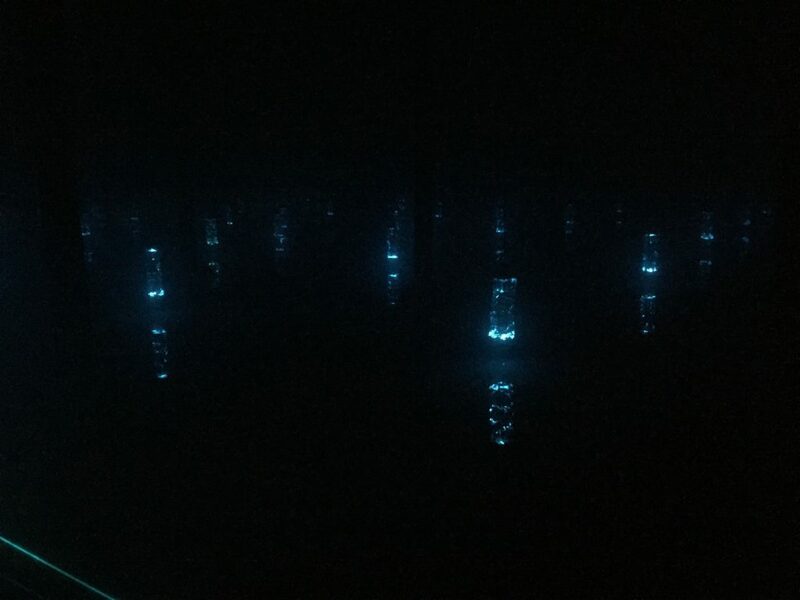 In one particularly eerie moment, these shapes hung very low over the water — as if threatening to descend right into it — before rising back up into the “stars”. The music during this whole section seemed mournful, haunting — I can’t even start to describe it — but in my mind the whole thing started to crystallise as a piece that was really, truly indifferent to human beings. Like the planet itself, perhaps. The planet that we are irrevocably altering with our own indifference towards it. The glaciers are melting. Sea levels are rising. The next Great Extinction of earthly species is already underway, and we started it — round about the time of the Industrial Revolution, when this building went up and we started burning fossil fuels at an ever-more-exponential rate. Aurora, then, evokes the facts of a very Dark Ecology. . . . But the oceans will outlast us. And so, in the end, will the ice. 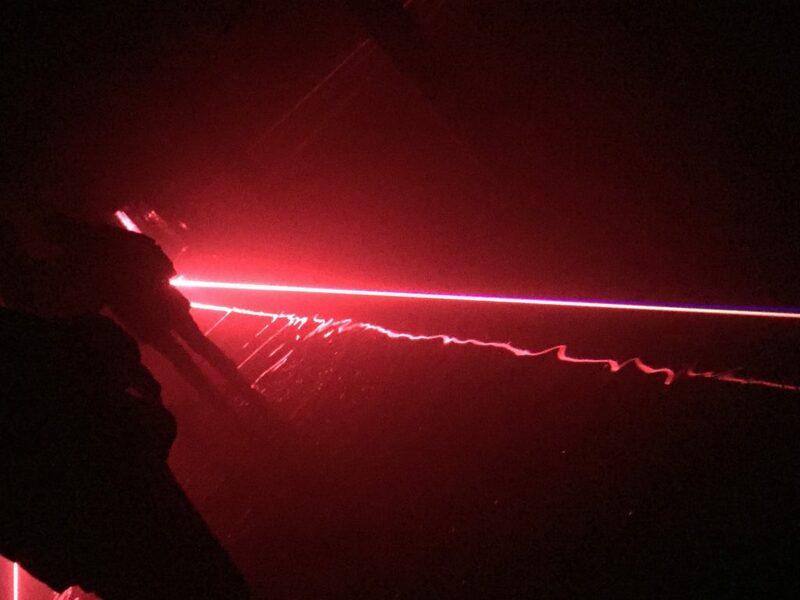 Towards the end of the piece, sharp shafts of laser light begin to stab their way into the middle of the space — as if from the outer edges of outer space. 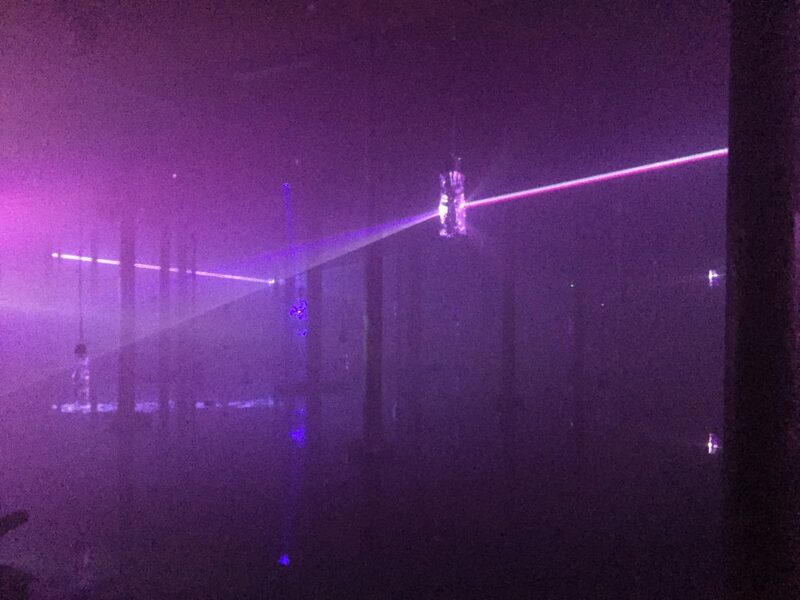 And then, before you know it, those beams are catching and refracting through the hanging icicles, and the music goes from somber to strangely joyful, and there’s a dazzling symphony — or choreography, or something — of co-ordinated light and sound. Perhaps this, finally, is the aurora borealis evoked by the piece’s title. The Northern Lights. The spectacular natural light show that’s visible in areas approaching the north pole. (Come to that, it could equally well be the aurora australis – the Southern Lights. Both the ice-caps are melting, after all.) 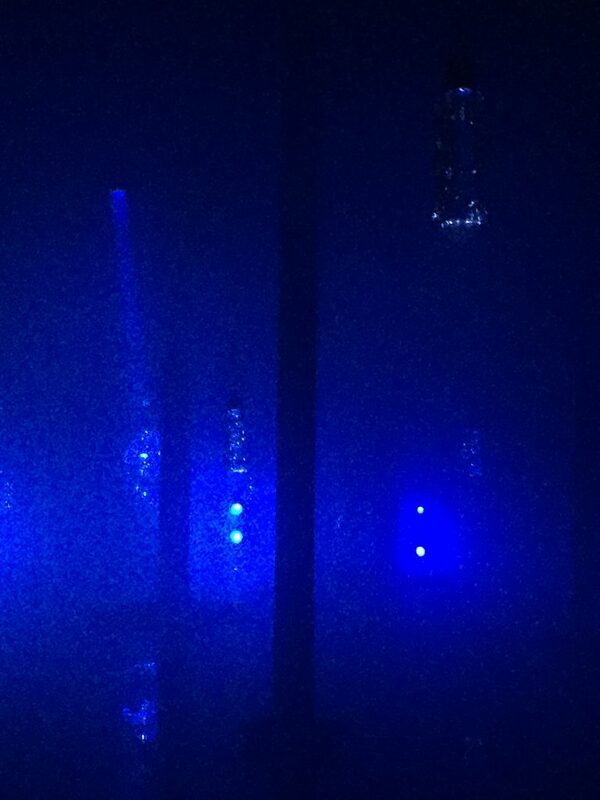 For me, though, something about those lights beaming in from outer space made it something else again…. A picture, perhaps, of an ocean-covered earth echoing with the music of the spheres — catching the starshine arriving from light years away, and amplifying its harmonies. An earth no longer despoiled by humans, but restored to one-ness with the rest of the universe…? The universe is beautiful … but cold. Having reached its climax, Aurora ends, and mysterious ice blocks appear lit at the corners of the walkways, to help light our way out. Ice blocks with items frozen inside them… is this an arrow? a quill? …human relics of a forgotten civilization, preserved in ice forever. And outside, it’s still raining. It’s still Liverpool. And those walls that had seemed so imposing and forbidding when we went in seem suddenly much smaller, more ordinary… But ordinary like the outside of the Doctor’s Tardis. Because a moment ago they contained the universe inside… And so we repair to the launch reception for Aurora. 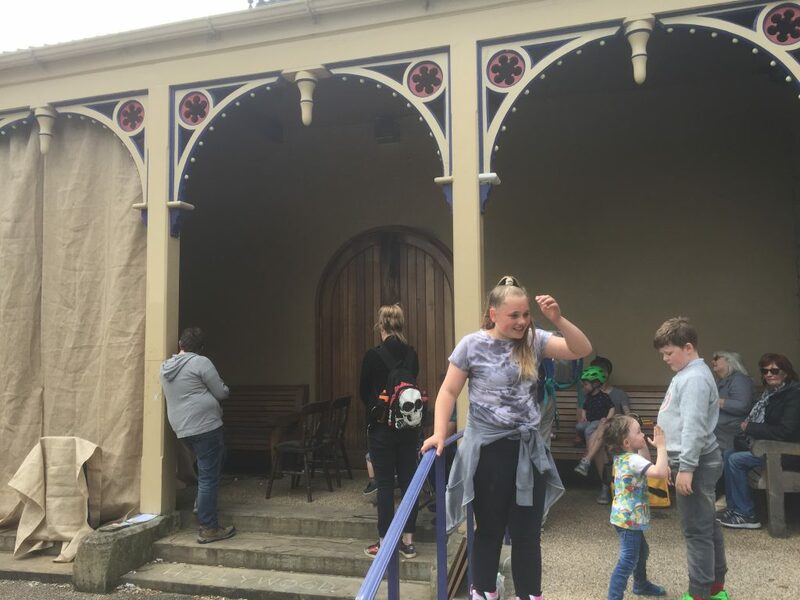 Just up the street, on the other side of the Catholic Church, is the Mount Carmel Social Club… a community venue where members of the local community mix in with the slightly incongruous arty-types who seem to be staffing the show. 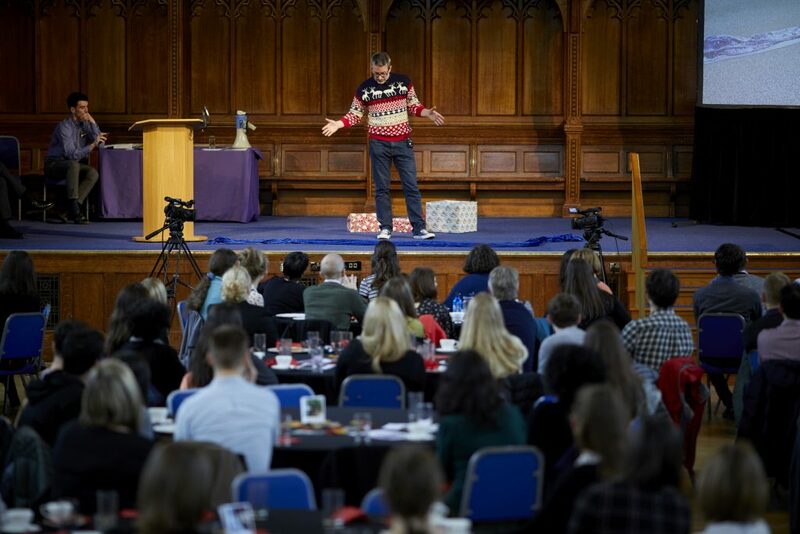 Once everyone has a drink, the absence of words during the performance itself is (over-)compensated for by an excess of words from the great and the good — the Arts Council, the City of Liverpool, the commissioning body FACT, etc. It’s all the usual corporate verbiage that you get on such occasions, but it’s even harder to listen to than usual after what we just witnessed. Representing Invisible Flock, though, Victoria Pratt is refreshingly brief in her comments. She prefers, I think, to let the work speak for itself. 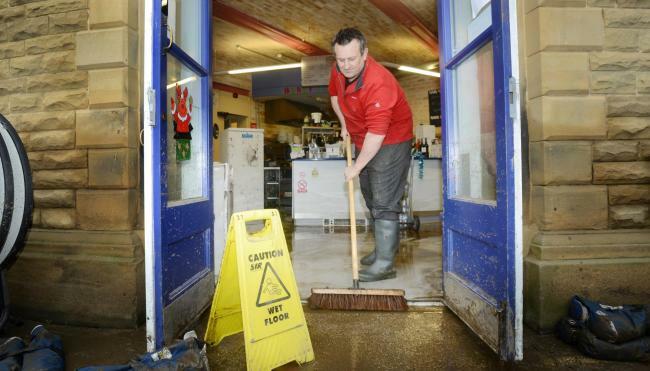 There’s been a weird sense of deja vu this week, as the persistent rain across large parts of the UK led to flooding particularly in northern Lancashire and Cumbria. As reported in the Guardian and Telegraph and elsewhere, upwards of 70 people had to be rescued, and many homes were underwater, after a new local record was set for rainfall in a 24 hour period… Some of the areas hit were the same ones affected by Storm Desmond just under two years ago, when severe flooding hit the Lake District in early December. 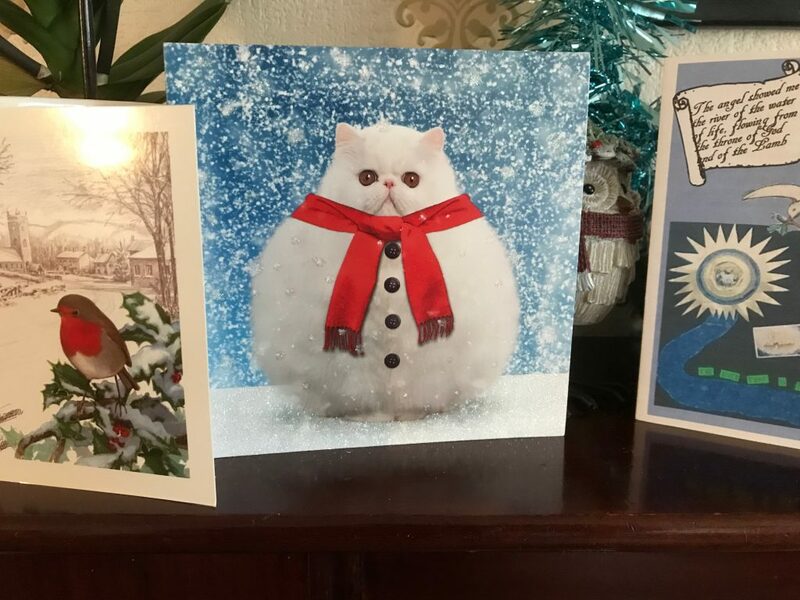 That was followed, of course, in good alphabetical order, by Storm Eva — which brought the Boxing Day floods of 2015 to the Aire valley, Calderdale, York, and many other places across the north of England. Let’s hope that history is not about to repeat itself. 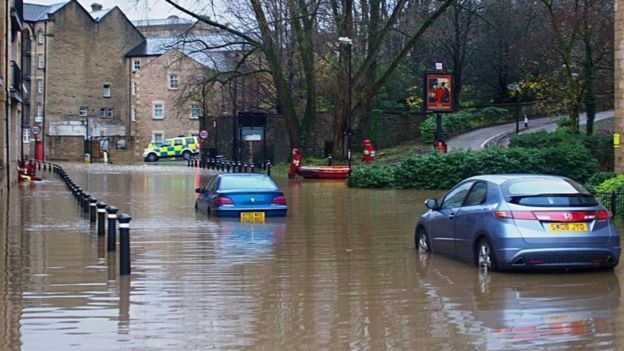 But river levels on the Aire have been persistently high again recently, just as they were in the run up to Christmas in 2015, and on Wednesday the Environment Agency issued a flood warning for the Upper Aire – west of Keighley. It all seems worryingly reminiscent of two years ago. But maybe we shouldn’t even be surprised… maybe this is the new normal. The occasion was a lunchtime meeting of the Insurance Institute of Leeds (or IIL – the local branch of the Chartered Insurance Institute, CII). Normally these lunchtime sessions are lectures by invited professionals on insurance-related matters. It’s basically a CPD slot (continuing professional development), and attracts a sizeable audience of folk from Leeds-based insurance companies. 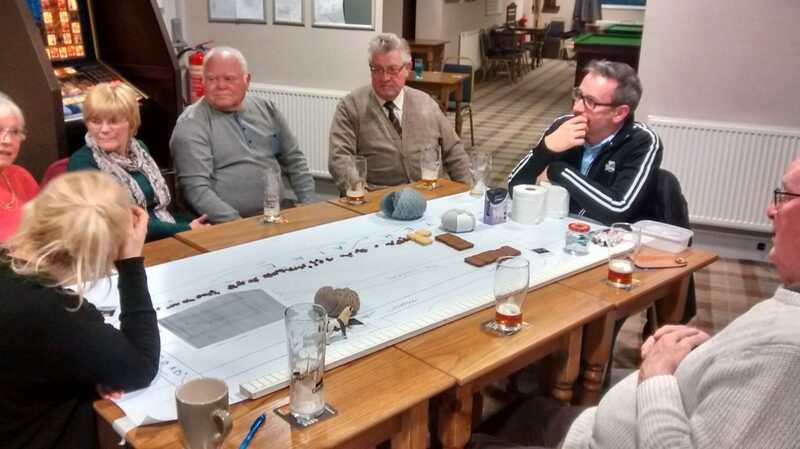 There were a good fifty or so people in attendance for the session last week, and this included a good handful from the Shipley/Baildon area, who enthusiastically introduced themselves to me afterwards. 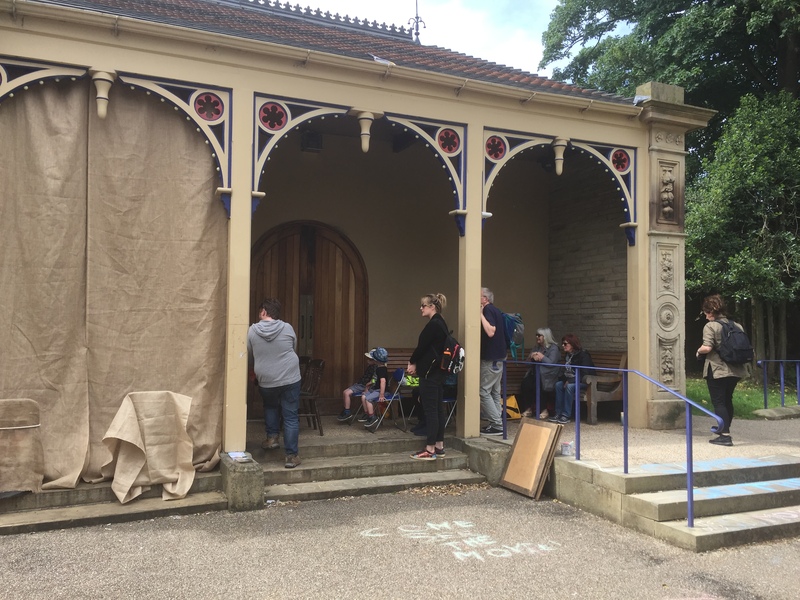 One woman announced herself as the person who had dealt with the insurance claim for Half Moon Cafe, in Saltaire’s Roberts Park, which was of course badly hit on Boxing Day (and features in the show). 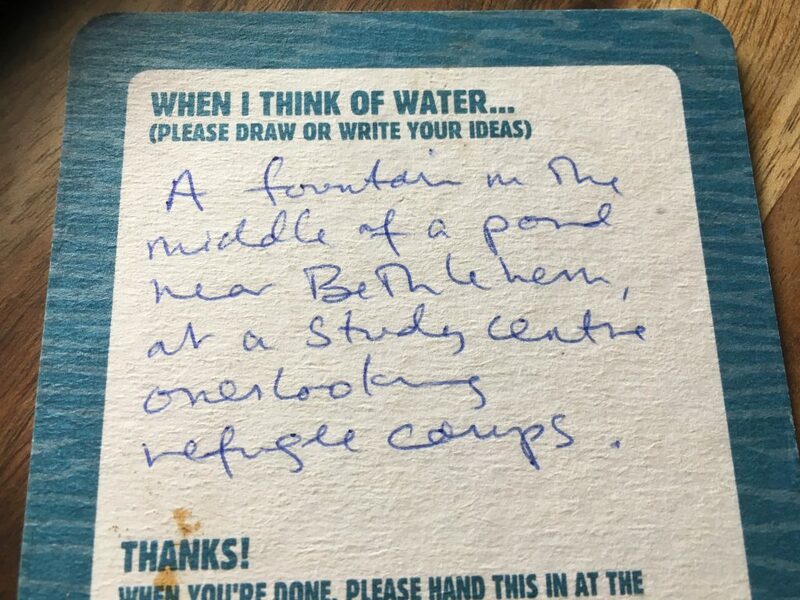 I think the intention of Melanie Jordan, who organised this event, was to get her colleagues to think about flooding more holistically — not just as something they deal with in terms of paperwork and statistics, but from the human point of view. 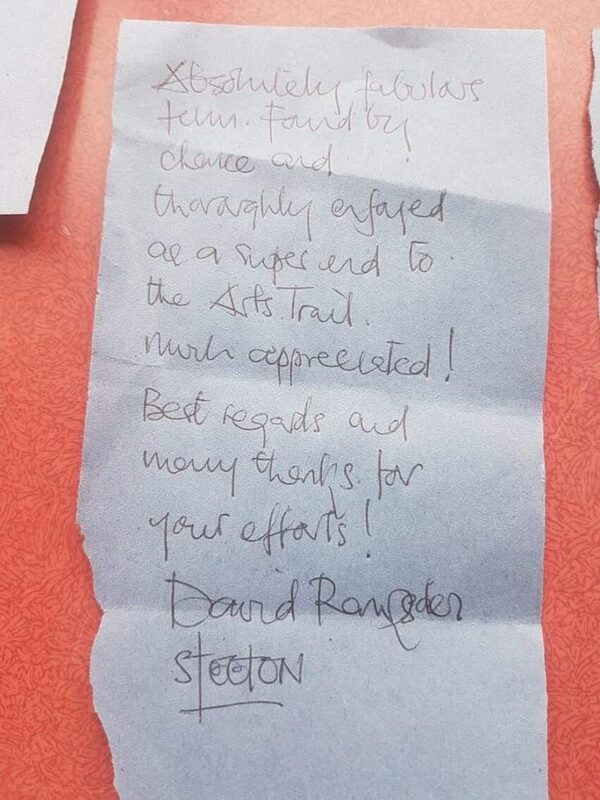 She had initially approached Chris Sharp, a curator with Leeds City Museums, who also then recommended me. We spoke as a kind of double bill: he went first with the more traditional powerpoint presentation, then I did my performance. 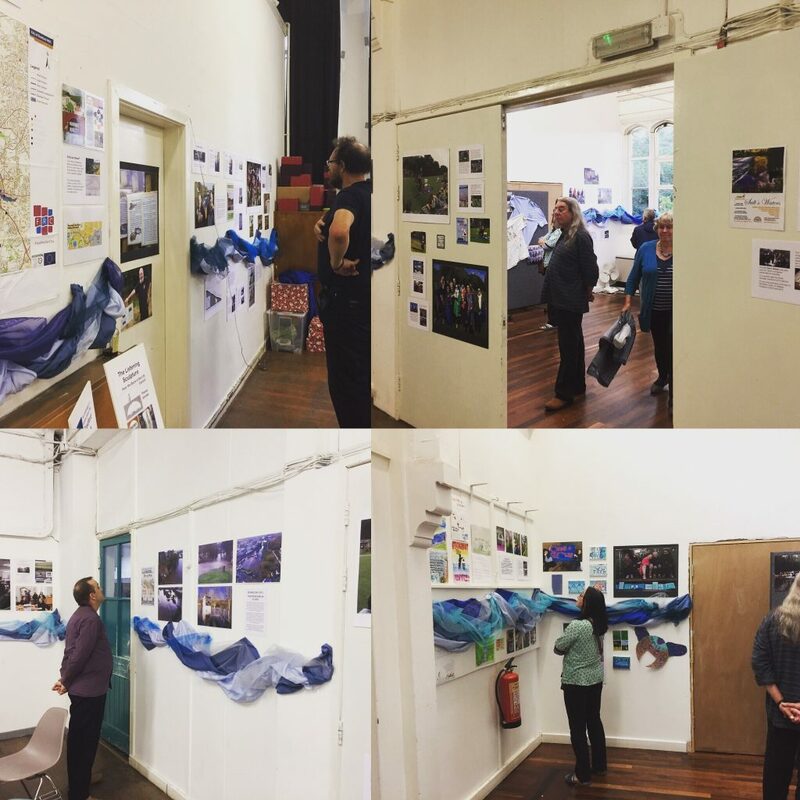 Chris had organised the Flood Response exhibition at Armley Mills that ran from last December to May this year. 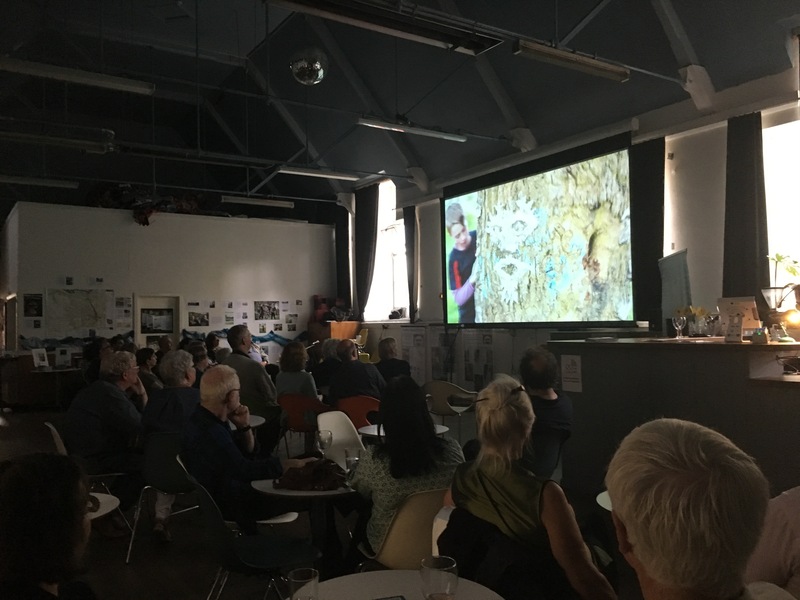 His remit is specifically to curate community-focused exhibitions that draw on contributions from local people, and so he had seen many images and heard many stories about the Boxing Day flood as it impacted on Leeds — particularly in the Kirkstall area. 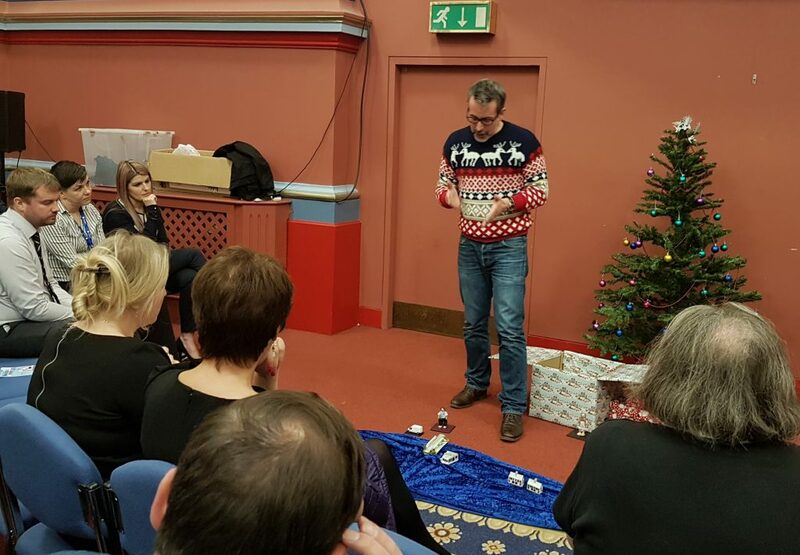 Chris He spoke movingly about his experiences with the community there while preparing and mounting the exhibition, and he also put the 2015 event in context with other, historical floods, that the museum service had records and images about. He gave a fascinating presentation at the front of the hall, and we then asked the audience to literally turn around to face the back wall, where I had set up for Too Much of Water. This was an attentive audience, but also a rather quiet one. 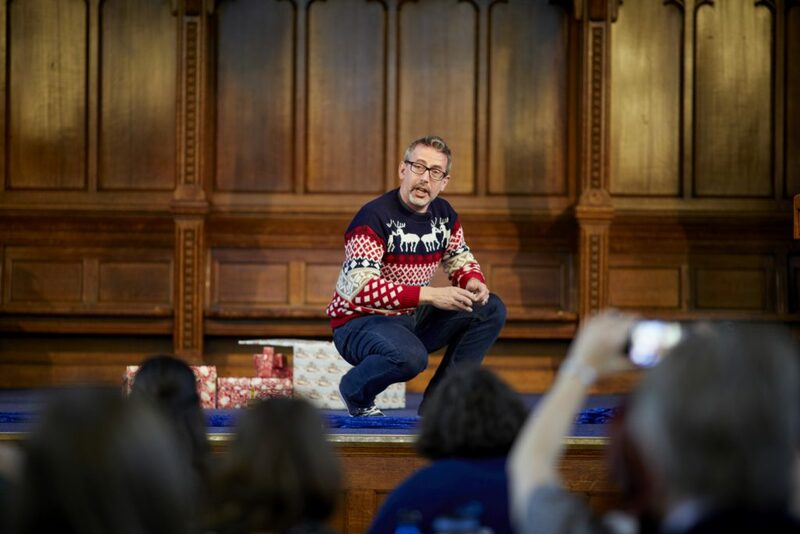 They seemed unusually reluctant to laugh at what I have come to think of as ‘the funny bits’ (I’ve done this show enough now to know when to expect an audible response), so I wasn’t quite sure how it had gone down. 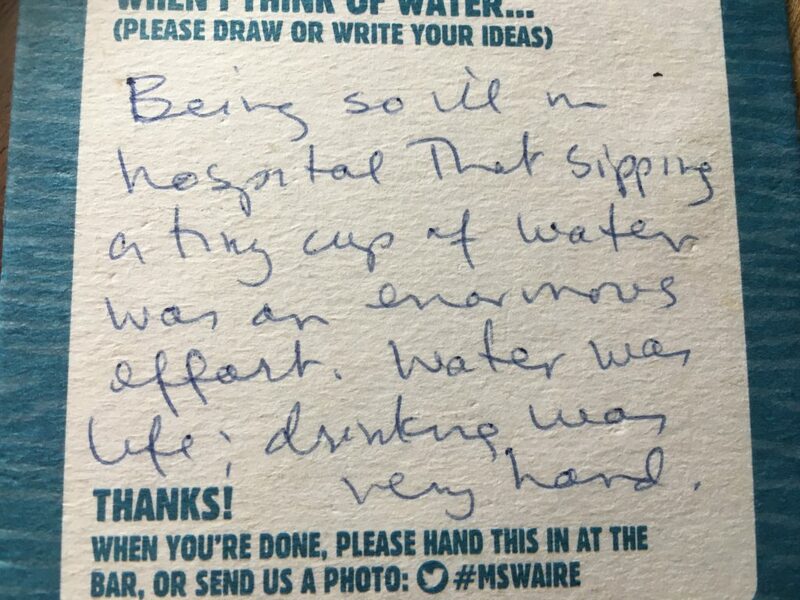 It was reassuring and heartening, then, to receive written feedback via Melanie this week, which was overwhelmingly positive. 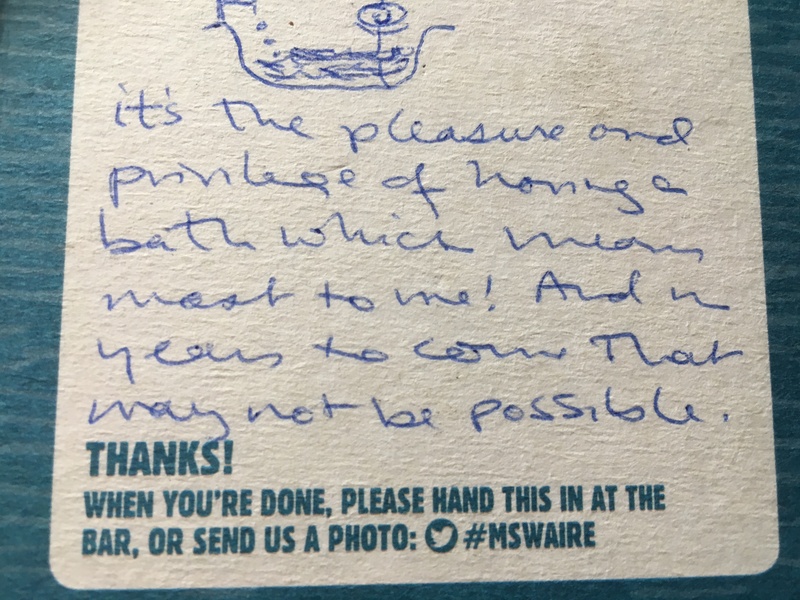 Apparently there is a standard online feedback form for these sessions, where respondents tick numerical boxes (Chris and I scored well, it seems), and then can also leave any ‘further comments’ they feel inclined to offer… The written comments are all reproduced below, in the interests of full disclosure! Because if this is the new normal, there will be future flood victims, perhaps sooner rather than later. 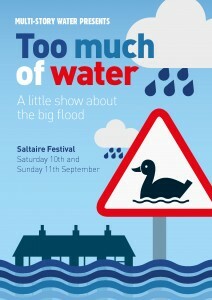 At the start of the month, I presented Too Much of Water, my one-man storytelling show about the impact of the 2015 Boxing Day floods in Shipley, at the 7th International Conference on Flood Management (icfm7). This was held at Leeds University, and having been asked by the conference organisers to present the piece as part of their “cultural programme” (alongside all the more technical conference talk), I liaised with my former colleagues at the University’s Workshop Theatre to present the piece there (many thanks, especially, to technical director Lee Dalley). This was the first of several new engagements for TMoW this autumn, so I took the opportunity to do a slight “upgrade” on the show. 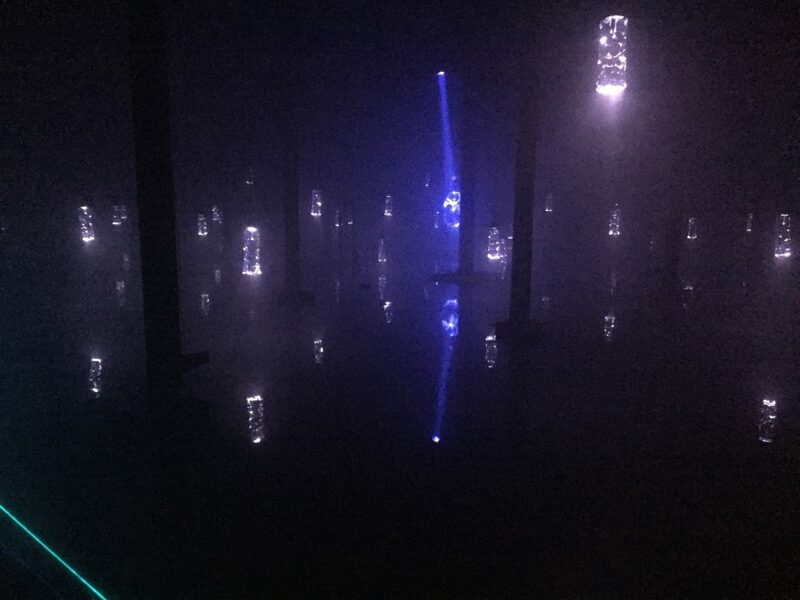 Despite having been very well received in previous performances, I have always felt there was something slightly missing: the piece focuses on the stories of six families whose homes were affected by the flood, but until now did not acknowledge the impact on any local businesses — which, in its own way, can be just as devastating. So I’ve now worked in a seventh storyline, that of Brian Tuxford of Northway Vehicle Sales – the van hire business next to Baildon Bridge. 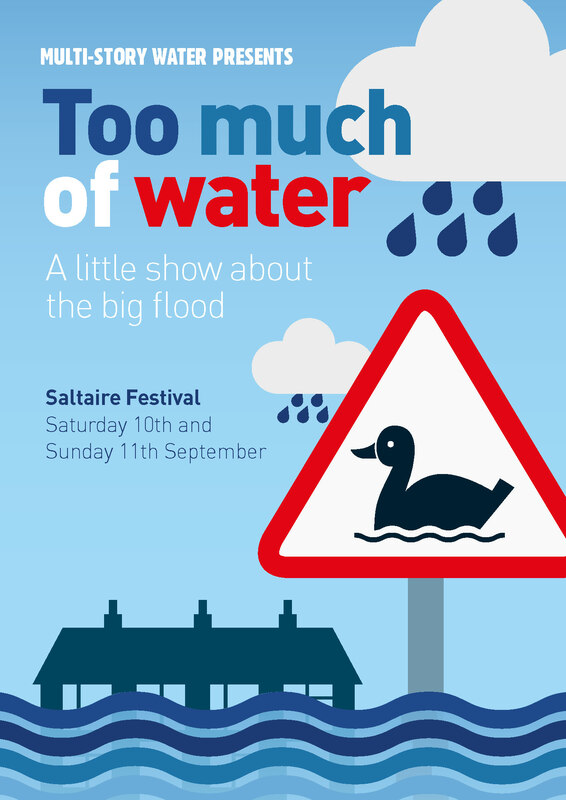 I told a little of Brian’s story in this blog last autumn, having met him after the first version of Too Much of Water premiered at Saltaire Festival. It felt important to include his story, and the show now feels more “resolved” to me as a result. After the Workshop Theatre performance, we held a Q&A session about issues arising, to which I’d invited two excellent guest speakers – Jonathan Moxon, who is Leeds City Council’s chief flood officer (formerly of the Environment Agency, he has featured on this blog before) and Rosa Foster, who lives in Shipley, and is the Environment Agency’s lead FCRM officer for the Upper Aire Catchment (i.e. 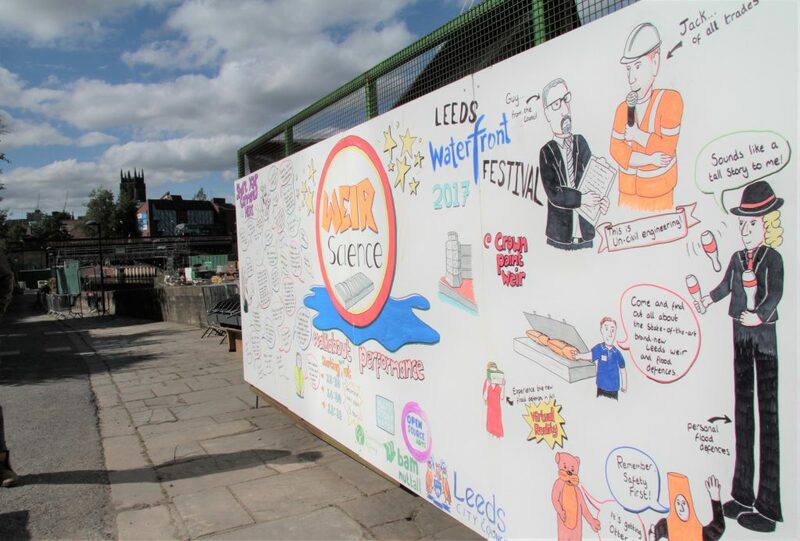 Leeds and everything up… FCRM = Flood and Coastal Risk Management – though there’s not much coastline on the Upper Aire!). The Q&A was videotaped and I’m delighted to be able to show it off above – it makes for an interesting discussion. (Though it’s a little difficult to hear the audience questions on the recording, due to the mic direction, the answers should hopefully clarify…). 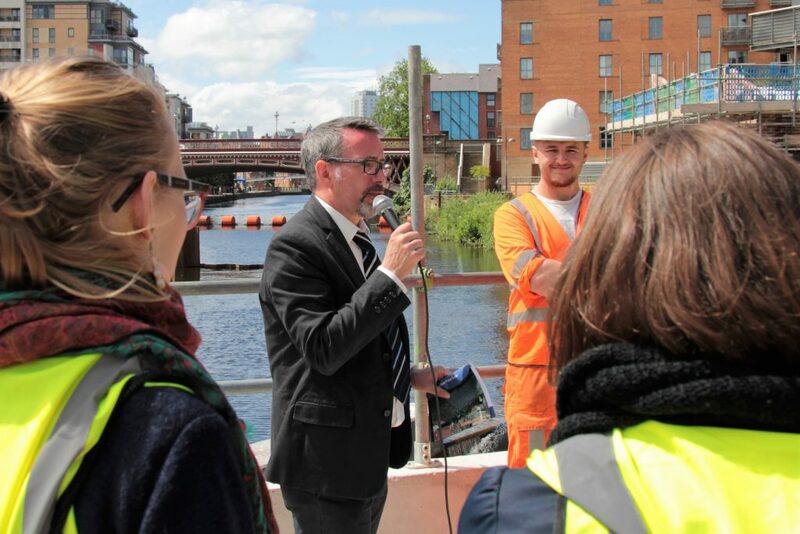 Our connections with colleagues such as Jonathan and Rosa has led our Multi-Story Water project to quite an active involvement with telling the story of the Leeds Flood Alleviation Scheme (this despite the fact that our project was centered in Shipley/Bradford! 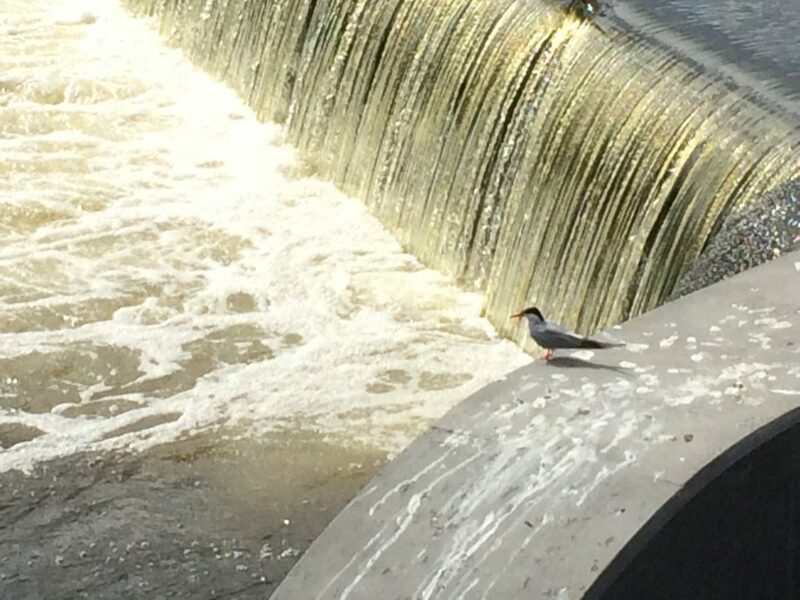 The Aire keeps flowing regardless of local government jurisdiction…). 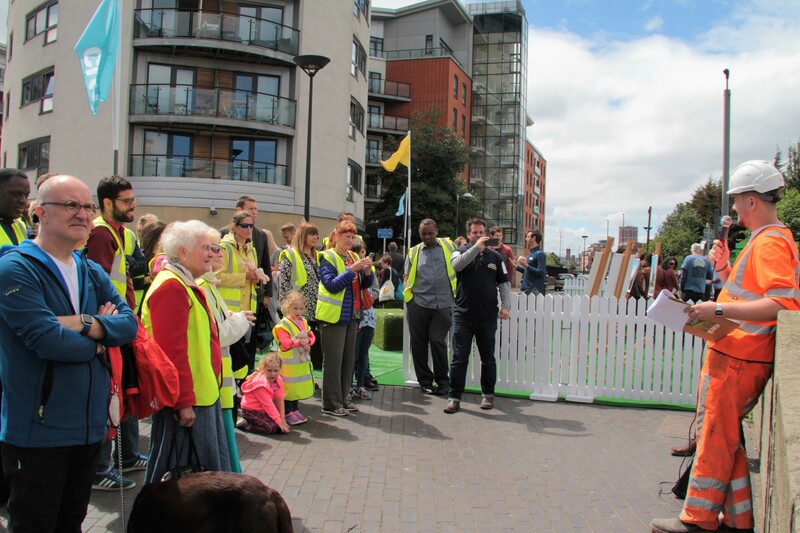 At the Leeds Waterfront Festival in 2016, in collaboration with Common Chorus Theatre, we presented After the Flood – a promenade performance that attempted to provide audiences with an engaging sense of some of the issues involved in planning for flood alleviation – and this included a brief synopsis of the “FAS” scheme (its brand new, collapsible weirs represented on this occasion by a [comically crap] demo involving a clipboard and a balloon…). 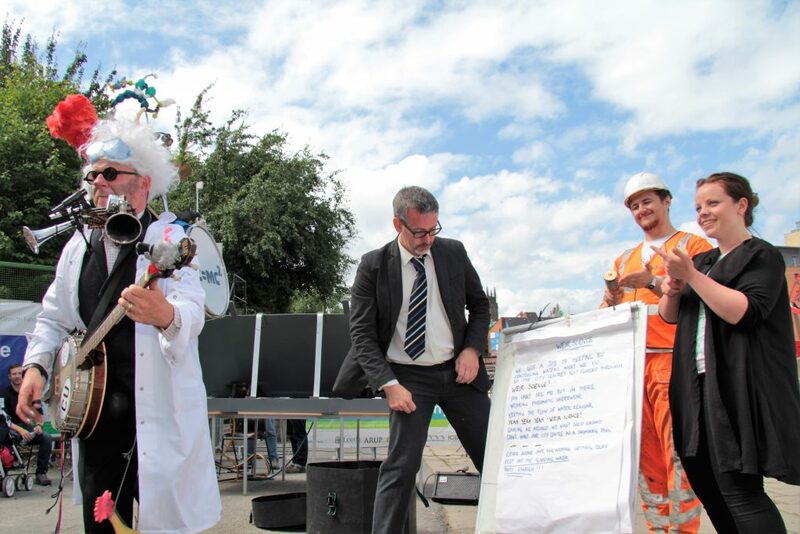 A year on, at the 2017 Waterfront Festival, we worked more directly with the FAS scheme and its main engineering contractors, BAM Nuttall, to present Weir Science – an entertaining, in-depth look at the new weir construction at Crown Point. 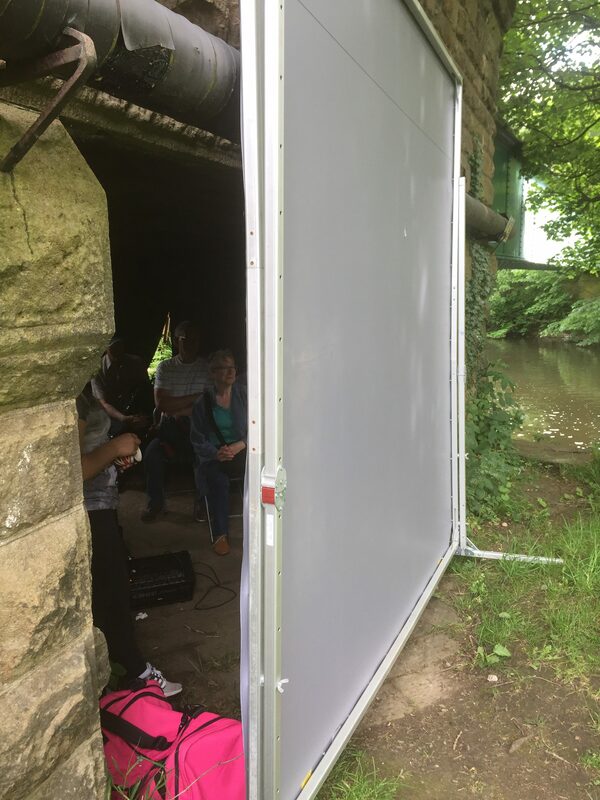 On this occasion, we collaborated with Phil Marken’s Open Source Arts – an important hub for the voluntary flood response in the Kirkstall area. There’s a serious point to the FAS team wanting to share their thinking about the new scheme – and to seek feedback – and we can’t upstage or disrupt that with anything too “showy”. So we’ve come up, instead, with a sort of “modular” presentation – composed of different props, arranged on a display stall, that all offer different talking points. The strategy will be to draw people into conversation around whatever catches their eye from our display. 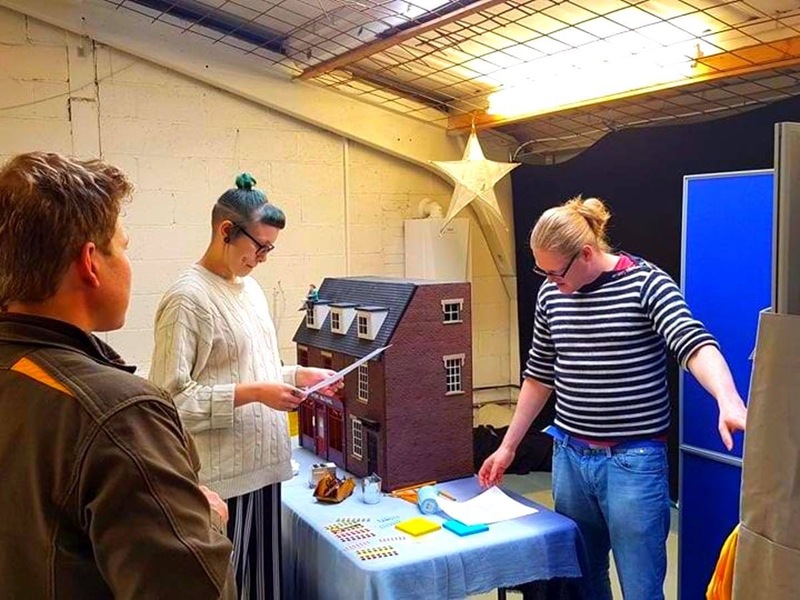 (The doll’s house and other components have been carefully integrated design-wise by Simon’s colleague Ellie Harrison.) We’ll then to seek their responses to the various ideas we’re opening up for discussion. 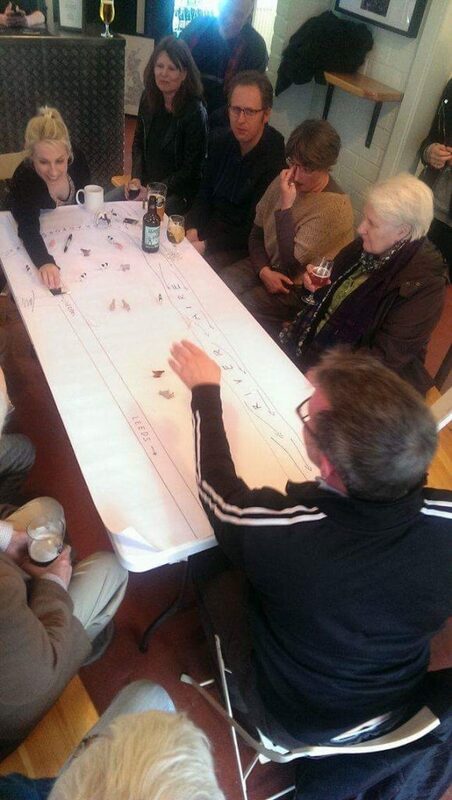 We’re not thinking of this as a “performance”, as such, but as a series of unique, person-to-person conversations – led by Alice and fellow presenter Jaye Kearney — which use props and images as a stimulus for discussion. The conversations might roam between the different “modular” elements, or not, as the mood dictates … they can be as long or as short as suits the individual passer-by. The main thing will be to whet people’s interest, and thus – perhaps — encourage them to engage in conversations with the FAS team themselves (who can then offer more involved, technical detail if people want it). 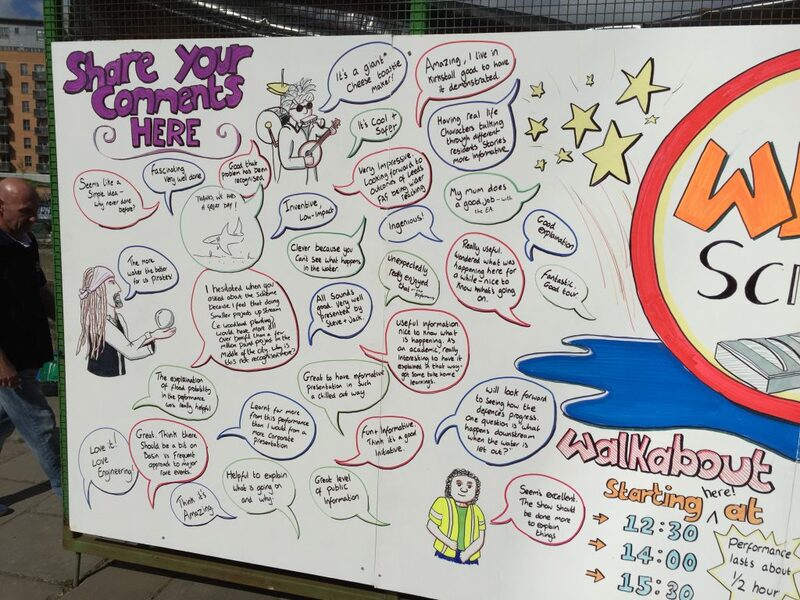 Some respondents would engage with them anyway, of course, but the thinking is this creative engagement approach might help to “soften the landing” for people more wary of uniformed officials… (even if the uniforms are just FAS-branded T-shirts). Anyway, one way or another, we shall see how this works out. Further blogging to follow! I say that with tongue in cheek, of course, and I’m genuinely grateful to Paul Hudson’s producer, Trisha Cooper, for inviting me onto the show and giving me the unexpected opportunity to discuss our research project. 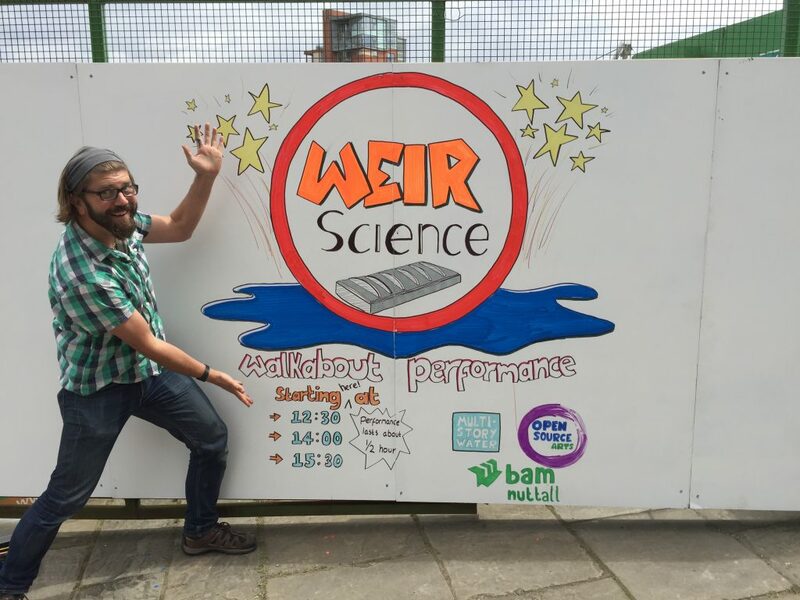 This came about because, after having me briefly trail the Weir Science performances on Johnny Ianson’s Radio Leeds breakfast show back in June, Trisha decided that listeners might be interested to hear more about the wider project that this had been part of. Although it’s quite difficult to try to sum up several years’ work in five minutes flat… And I did, apparently, gab on a bit too long, which explains the oddly compressed editing toward the end of my segment of this pre-recorded show (the last bit, which refers to the other matters discussed in this blog post, doesn’t make much sense as a result). Anyway… if you have read this post as far as this, you apparently don’t mind me gabbing on a bit… So thanks for indulging me, and enjoy the broadcast! “If you build it, they will come…” In the composite image above, we see different corners of Shipley’s Kirkgate Centre last Saturday night, as visitors peruse the walls at the opening of our exhibition, “Celebrating Shipley’s Waterways” (a phrase borrowed from the tagline to this website). 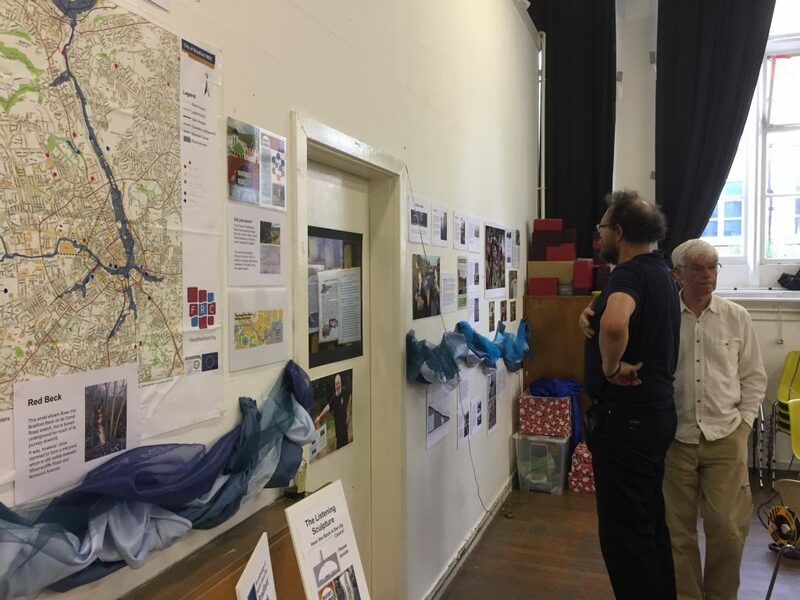 It was a real delight to see so many familiar faces that evening, helping us celebrate the official end-point of Multi-Story Water’s project work in Shipley. That’s five years of work, on and off (in two stages: 2012-13, and 2014-17). Visitors for the evening first had the opportunity to view the exhibition and mingle a bit, and then we screened three short films to represent different aspects of the project: first, Floody (made this year with the Young Artists of Higher Coach Road, for Saltaire Arts Trail weekend), then Wading to Shipley (from way back in 2013, documenting a walk down Bradford Beck), and finally High Rise Damp (from 2016, our film about social housing conditions in Bingley, which has a particular resonance now, in the wake of the Grenfell tower fire last month). I had not, personally, had the opportunity to see this last one screened properly on a large screen before (although it has been screened on several occasions by Kirkgate Centre’s Paul Barrett), and it was particularly gratifying to see that it had a real impact on the audience, prompting much discussion in the interval that followed. And here is the mock-up model, as exhibited the day before the Festival by BAM foreman Mark Pheasey (left) and two colleagues including stakeholder relations manager Jonathan Bulmer (right). 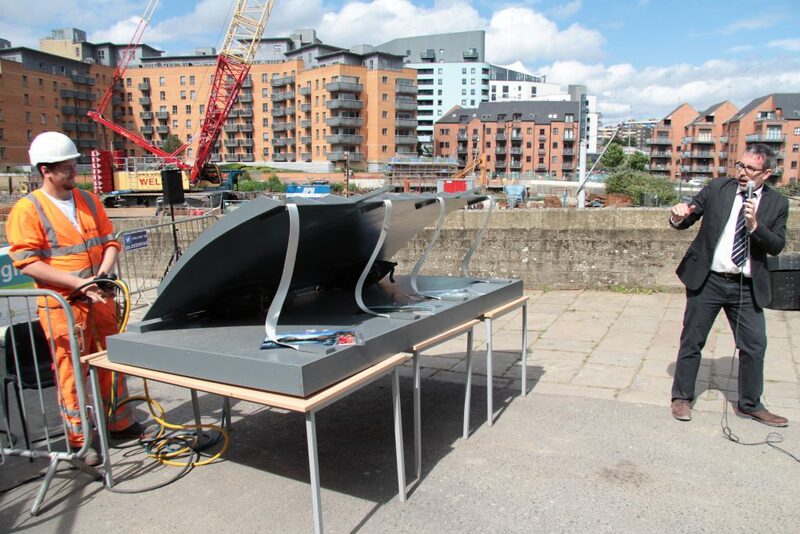 The model was originally going to be much larger — on the same scale as the real thing, and using one of the actual air bladders that will go into the weir installation (as seen below – the black rubber bladders stacked next to the metal weir plates at the FAS compound to the east of the city centre…). In the event, though, there were logistical problems with the full-scale plan, so Mark Pheasey dreamed up the scaled-down model using painted hardboard for the weir plate (which really does look like the real thing – as you can see) and some much smaller air bags, which didn’t have to support the weight of the River Aire! Actually I think this worked much better than the full-scale model might have, because the air-bags in the mock-up could inflate and deflate in seconds, raising and lowering the hardboard weir, whereas the big bladder would have taken at least half an hour to inflate fully. Much better for demonstration purposes! 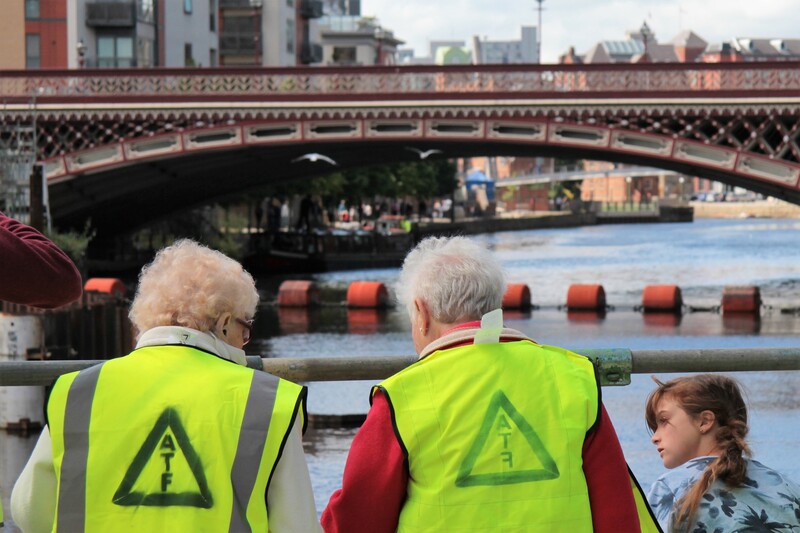 So this is the model in situ at the weekend, on the left (weir plate up), being explained to two members of the public by one of the volunteering FAS staff (the people with white patches on their T-shirt sleeves). 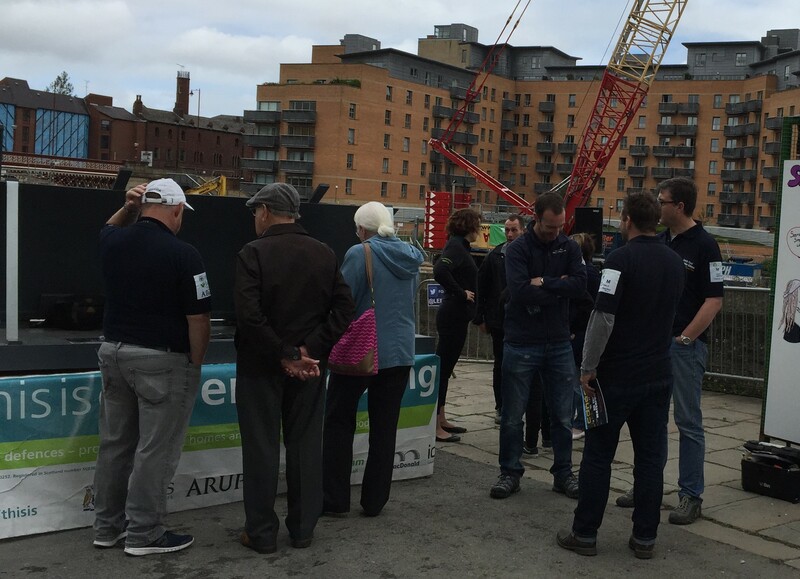 On the far right is Andy Judson himself, chatting to the Environment Agency’s Mark Garford and others. 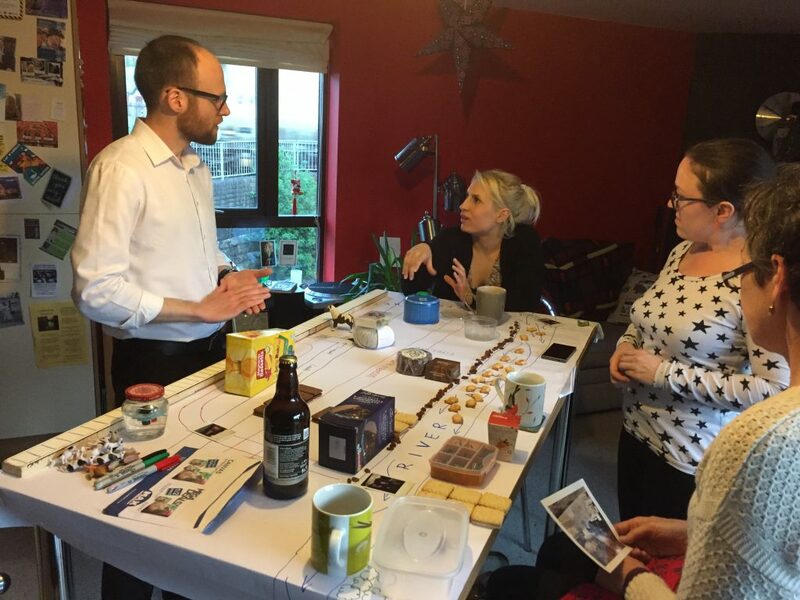 The FAS team were on hand all weekend, in different combinations, to chat to the public about the scheme from a more official, technical point of view — using the model as a point of focus. It became clear that word of the model demonstration had spread to some pretty influential places. 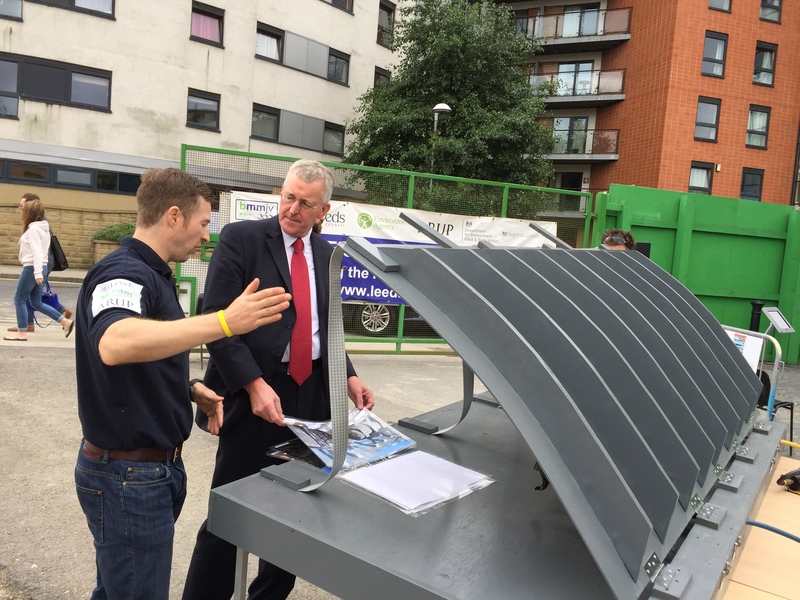 Above is Hilary Benn, Labour MP for Leeds Central, who seemed genuinely fascinated by the scheme when he turned up early on the Saturday morning. 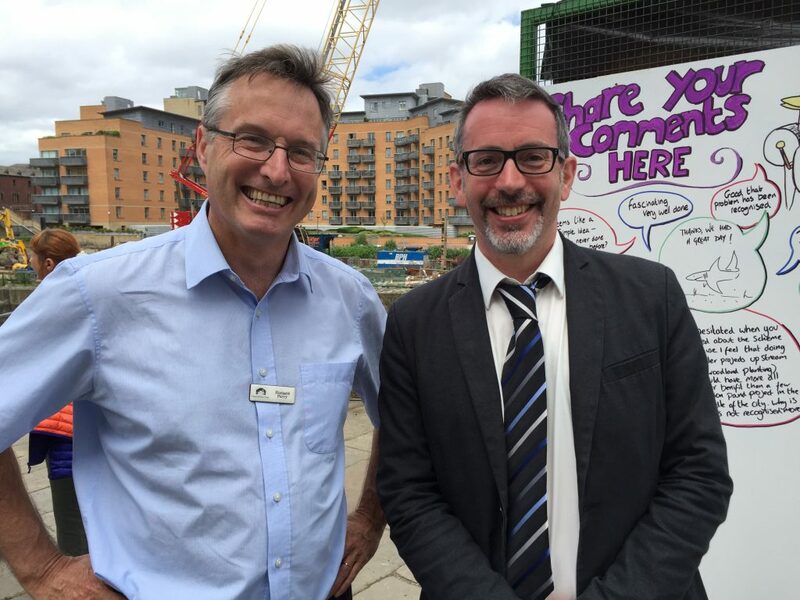 And on the Sunday, Richard Parry, the Chief Executive of the Canal and River Trust (formerly British Waterways) also stopped by to see what we were doing (at which point I shamelessly asked for a picture with him…). Despite this interest at policy level, though, the mock-up model and uniformed FAS team still looked — as they themselves put it to me — somewhat “dry” and “worky” for a festival weekend. 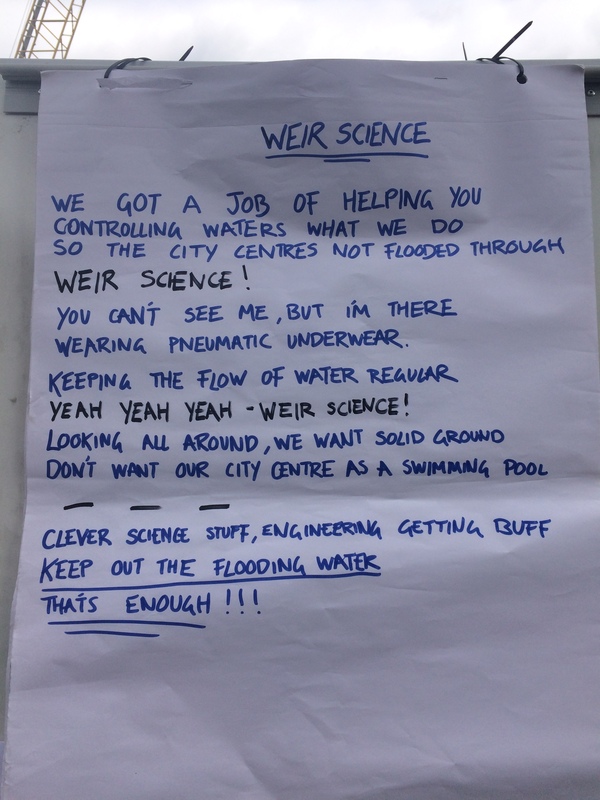 Somehow the general public had to be engaged a little more eye-catchingly, and this is where Weir Science came in …. 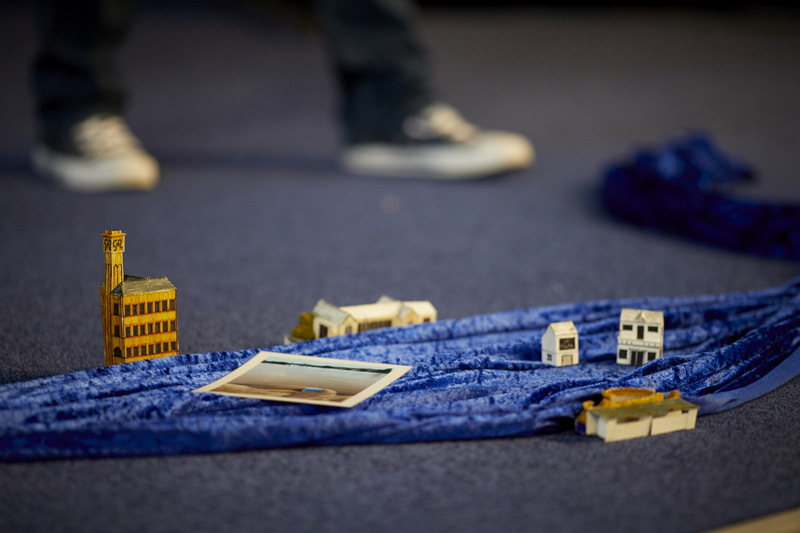 … that’s the name we gave to the creative elements we built around the FAS model. 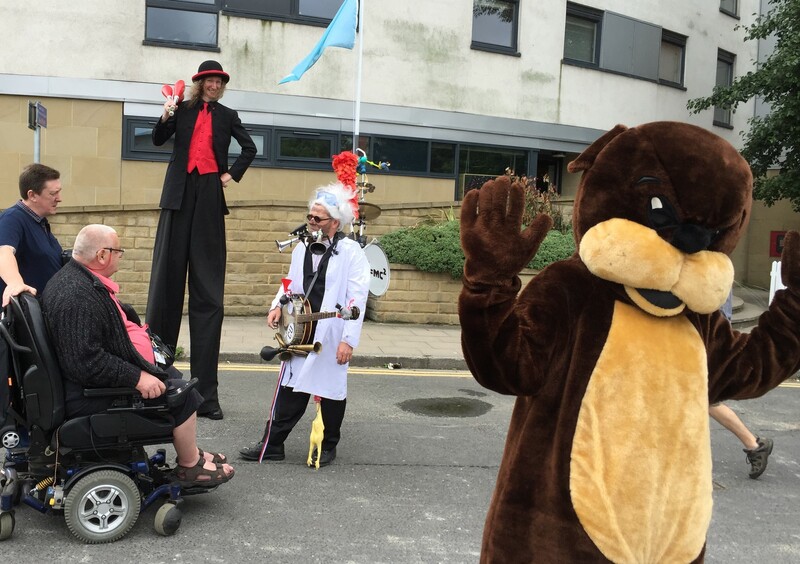 “We” being Multi-Story Water and Open Source Arts, in Kirkstall, which is run by Phil Marken (one of the leading lights in Leeds’s voluntary flood response after the inundation of Boxing Day 2015). 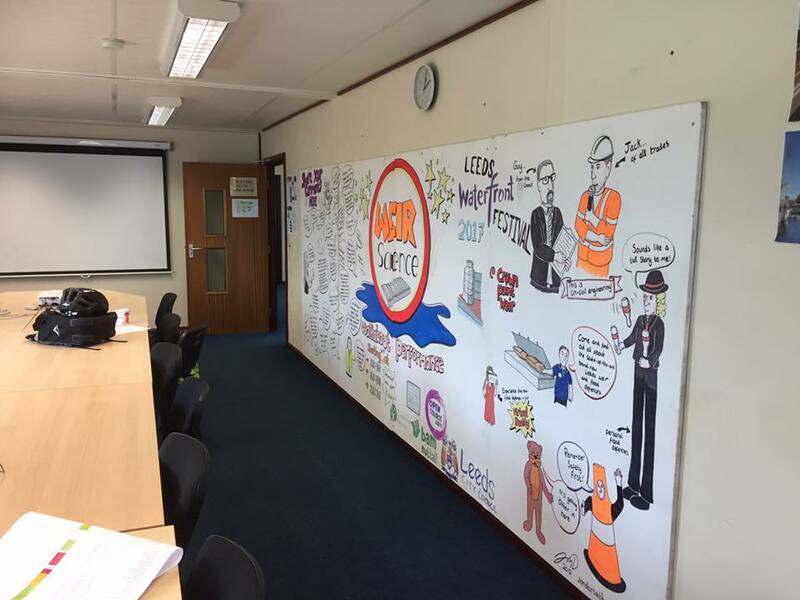 Phil himself wasn’t available at the weekend, but he had arranged for “graphic harvester” Jon Dorsett – above – to be on hand to gradually build up a visual record of the activities as they occurred, on four white boards that BAM staff had fastened to the open gate of their compound. 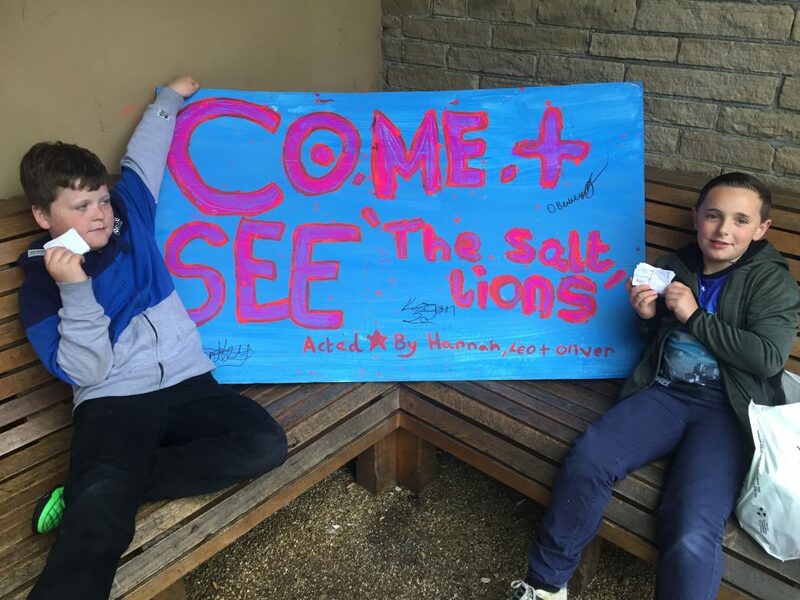 The first thing Jon did was draw this appealing, cartoonish logo for us – to catch the eye of passers-by… (I love that he even hand-drew all the logos… a lovely counterbalance to the ‘official’ signage). 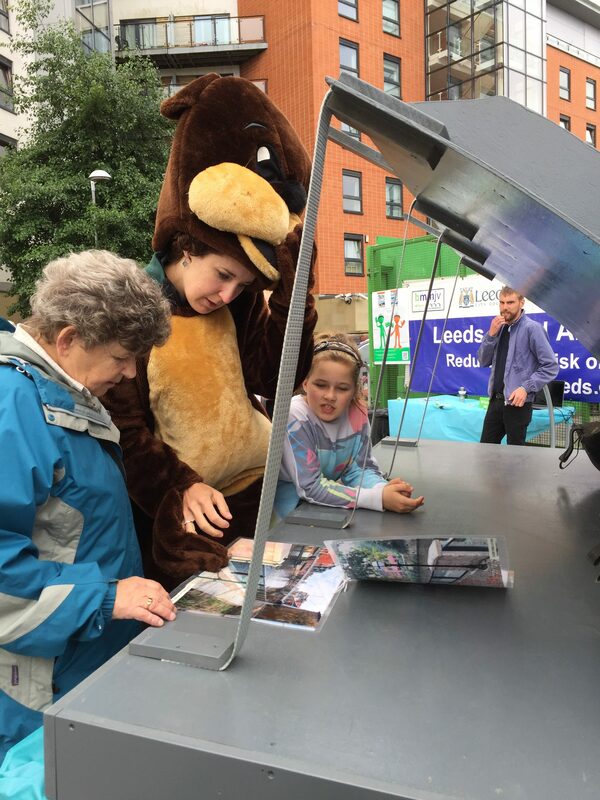 The otter costume belongs to the Environment Agency, apparently, and is often used at public engagement events. Here it is worn by Rosa Foster, one of the EA’s senior flood risk management officers, who found herself oscillating between waving goofily with the head on, and then lifting it up to explain details to passers-by… Rosa made the interesting point to me, though, that when she first put the costume on at the start of the day, people were waving at her, or posing for pictures with their kids, but weren’t readily being pulled in to talk about flood alleviation. After Jake and Nik started up, though, she found that the engagement process became much easier. 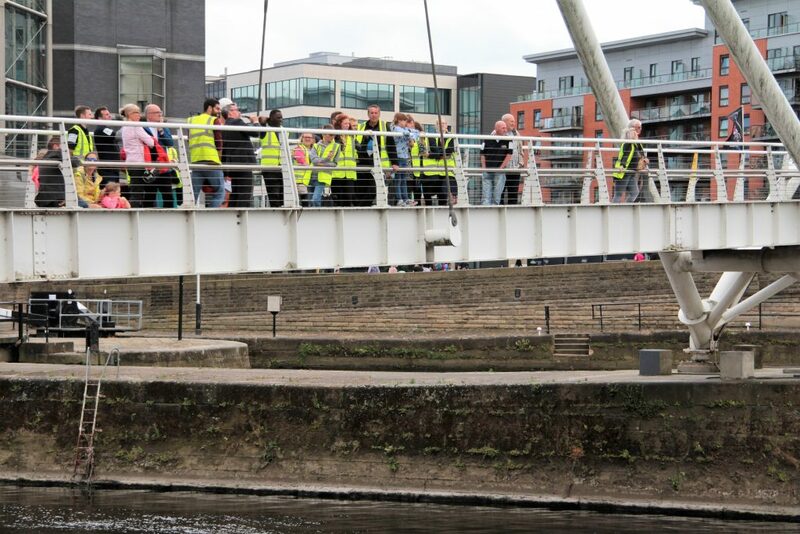 Andy Judson made much the same point, telling me that the performers succeeded in creating a much “softer landing” for the FAS team’s more technical explanations … Once drawn in by the sense of fun, spectacle and banter, people were much more willing to express their curiosity about the weir itself… and some great conversations then followed. Throughout the weekend it became clear that the FAS team were having a great time chatting with people, since the level of interest was so much greater than they’re used to. Here’s Professor Leaky-Faucet again (above), in the midst of the “pre-show” set that he delivered six times over the course of the weekend, before each of our Weir Science walking tours (starting at 12.30, 2.00 and 3.30 each day). On the occasion below, he was also accompanied by Nik — down off his stilts and doing his object manipulation routine. 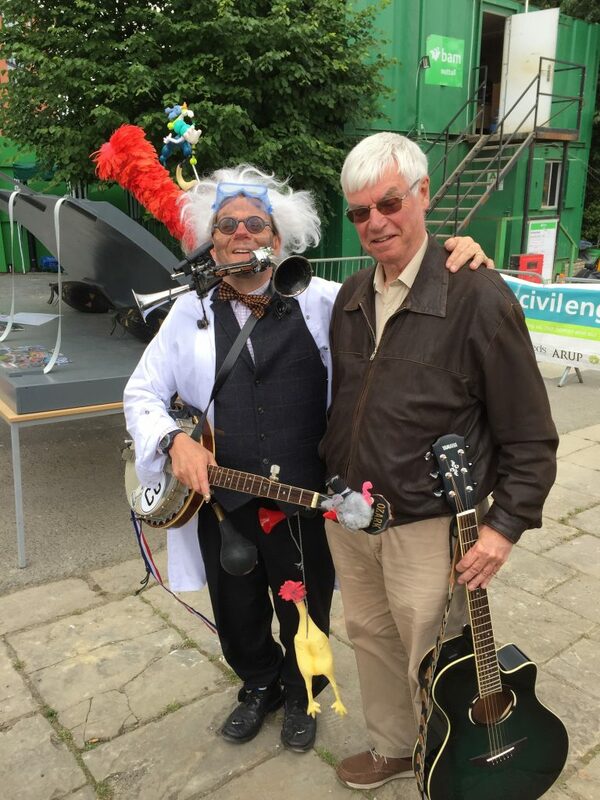 At one point this involved commandeering a child’s remote control joystick box, and appearing to use it to “drive” a wheelchair-user around in circles… this man played along gamely to hilarious effect (he was of course really operating his own chair!) .. thereby totally upstaging Jake! My script for this was based on a gently satirical reading of the research interviews I’d done as preparation: the idea was to bring a human side to the story, to offset and balance out our more technical explanations. 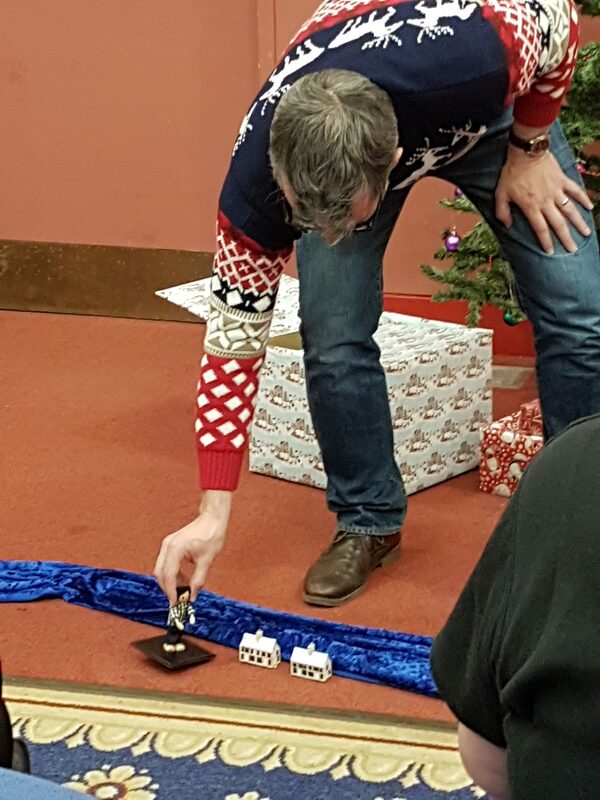 After completing our crossing of the bridge, we stopped outside the Turlow Court apartment building — badly hit during the Boxing Day flood of 2015 — to reflect on some of the residents’ feelings about the flood alleviation scheme (which are generally very positive, despite the temporary inconveniences involved with the construction process). Then, for our last stop, we brought the audience to a spot directly overlooking the new weir. This was within a fenced-off construction area, which had been specially tidied and made safe for us, for the weekend, by BAM staff. Finally, to wrap up, my good friend Eddie Lawler would appear to sing his brand new song, written for the occasion, “The New Leeds Weir”. This had a great, catchy chorus involving making the imagined sounds of the weir moving (“Psst! Fsssh! Bub-bub-bubble! 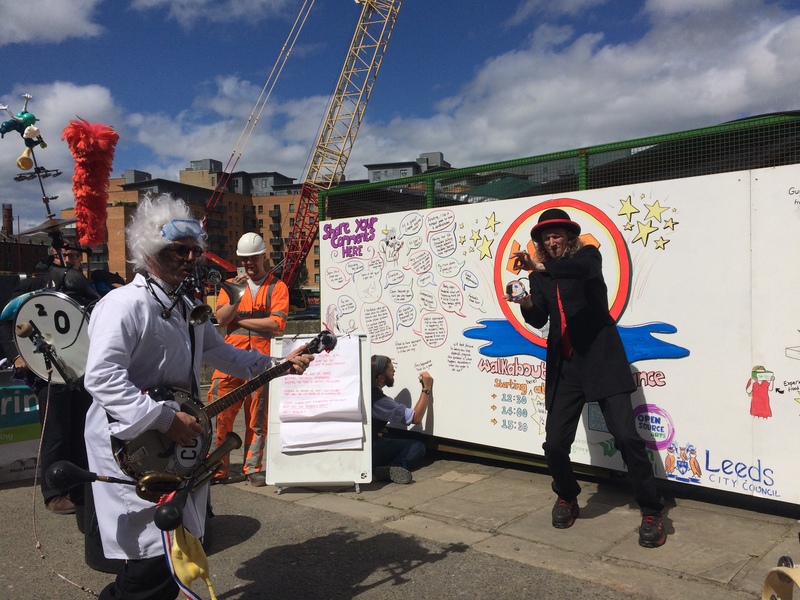 What’s going on at at the New Leeds Weir?”) which many audience members merrily joined in with. It was a lovely, relaxed way to conclude the presentation. A huge thankyou to everyone who collaborated on putting this weekend together — to Andy, Jonathan, Mark and everyone at BAM… to Rosa, Mark Garford and others at the EA… to my “sidekick” Jack Waterman, to Phil Marken and Open Source arts, stage manager Jenny, street performers Nik and Steve, and of course two very different musicians who wrote original material for the occasion… Jake and Eddie… Thanks all! By the end of the weekend, Jon had pretty much filled up that big expanse of whiteboard, and it was the last thing to get dismantled on the Sunday. I gather it might get preserved as a mural in a meeting room somewhere. So I made sure Jon signed it, bottom right corner. QED. 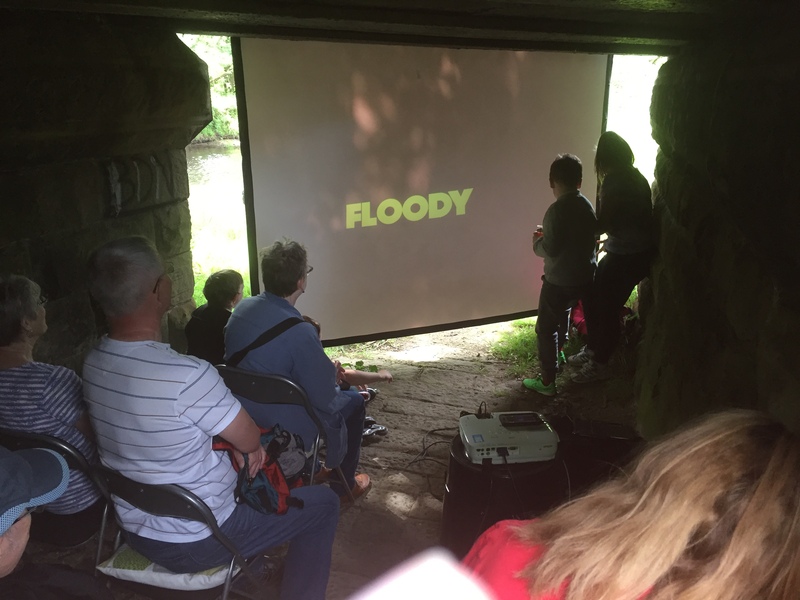 The pop-up screening was arranged as an unofficial contribution to Saltaire Arts Trail, which runs every year on the last weekend of May. The “trail” is officially limited to a tour around Saltaire mill village itself: you get to nose around various people’s homes, which have been temporarily transformed into miniature art galleries displaying work from far and near. 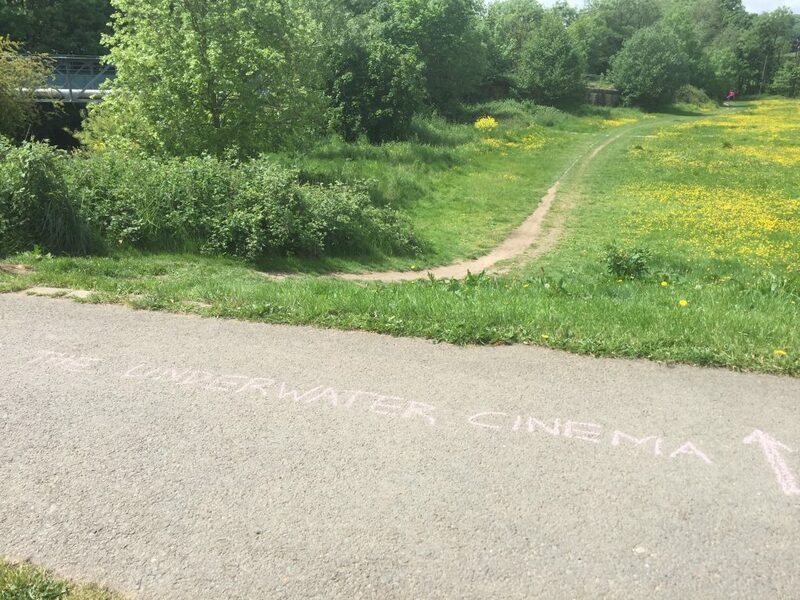 But we thought why not get people to “trail” out a little further along the river, and as some of the comments left in our feedback box showed, visitors to SAT were delighted to discover this added extra! 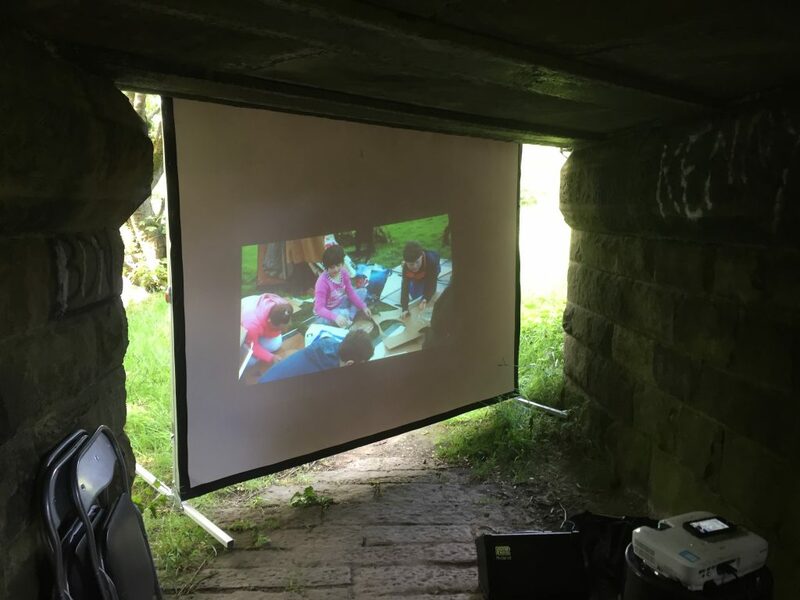 Despite our best efforts with hessian hangings, it was difficult to mask the light out as much in the park shelter as under the aqueduct, so the film image was fainter and smaller (as the projector had to be placed fairly close to the screen). 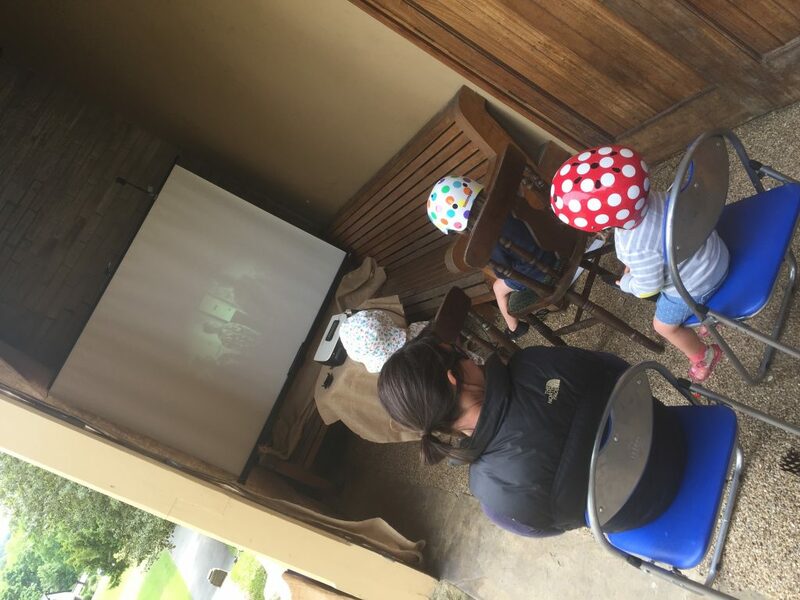 In a weird way, though, this complemented the silent movie “look” of the film, making it feel very old school indeed, like an old fairground cinematograph… And certainly audiences did not complain (kids of all ages, used to hi-tech digital gadgetry, watched this flickering image with rapt attention!). There was something about the film that just worked in this setting at the end of a Victorian park promenade… which of course was part of the intention. Higher Coach Road falls comfortably within the “buffer zone” which restricts planning within sight of Saltaire (subject to UNESCO approval), and of course the whole area that the estate is built on once belonged to Sir Titus Salt. 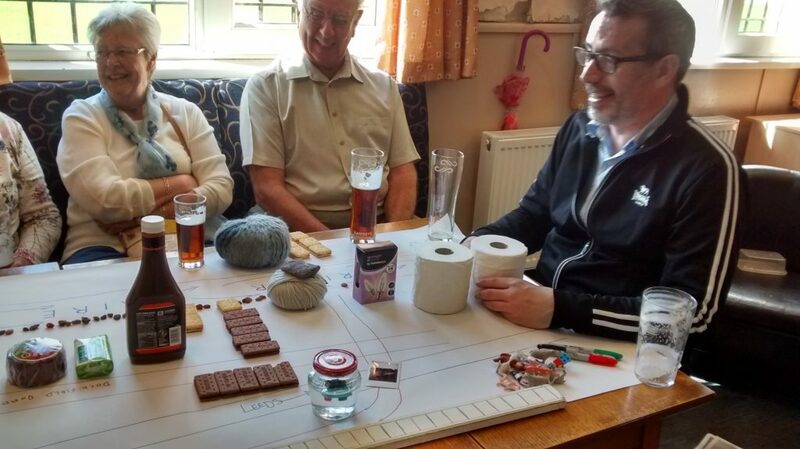 But the residents chose to mark the occasion by celebrating their own “heritage” as a post-war council estate by hosting a 1950s picnic … for themselves, and anyone else who wanted to join in…. Ruth and I are seated here in the “outdoor living room” that was Multi-Story Water’s contribution to the festivities. Cleverly assembled by Anna Parker from visits to a string of charity shops, this installation of 50s furniture and nick-nacks was well populated over the course of the afternoon, as people came and sat down on the surprisingly comfortable furniture to enjoy the sunshine. 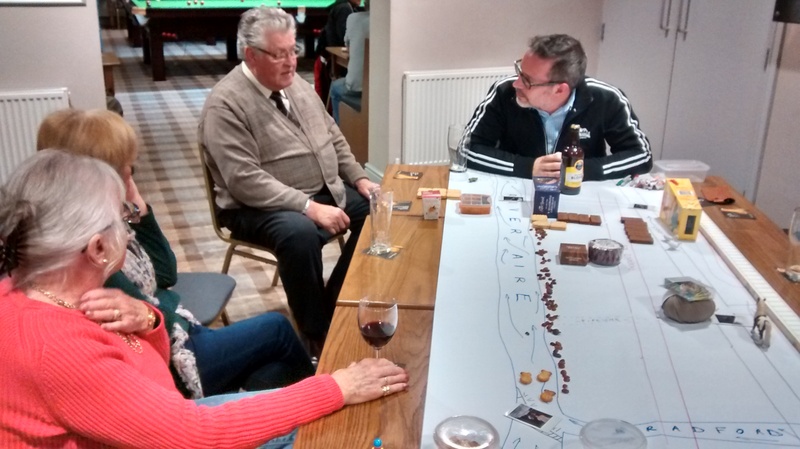 (it was behind a cloud when the photographer came, naturally…) That blue folder poking out from under the coffee table contained a selection of stories I had prepared about the area and its community and watery histories. I read these on request, in response to people picking titles from a menu we provided… such as “The Malicious Mr. Pickles”, “Higher Coach Road in the Ice Age” and “Ten Minutes of Madness (The Derwent Avenue Murderer)”. This was our “streaming service” for an age when most people didn’t have television yet… and it seemed to go down remarkably well! Some of the stories prompted considerable discussion. 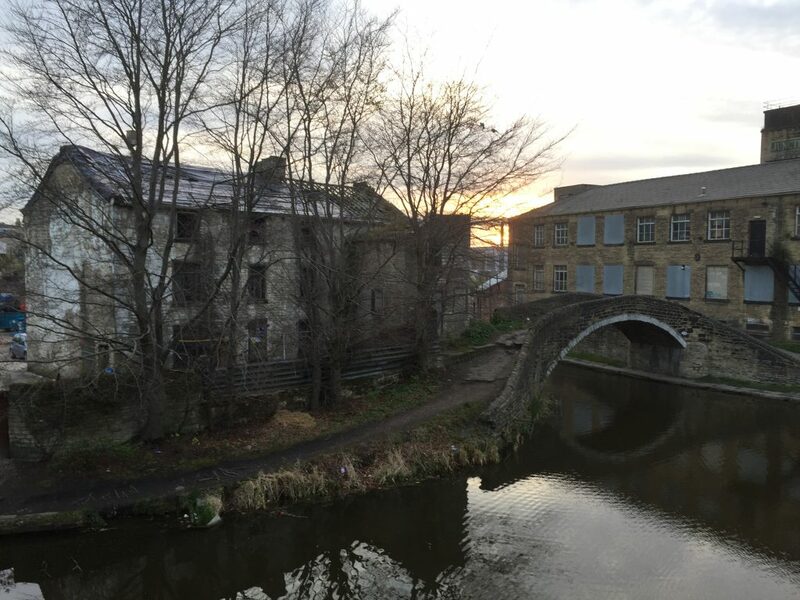 One resident, for example, shared her memories of working at Salts Mill in the 1970s — because she remembered as a co-worker the victim of the murder in my “ten minutes of madness” story (a black tale for a sunny day – it proved an unexpectedly popular choice!). Ruth and I had also collaborated on writing this leaflet, launched on this occasion as a joint effort of MSW and HCR Residents Group (the image shows the inside of the ‘gatefold’). 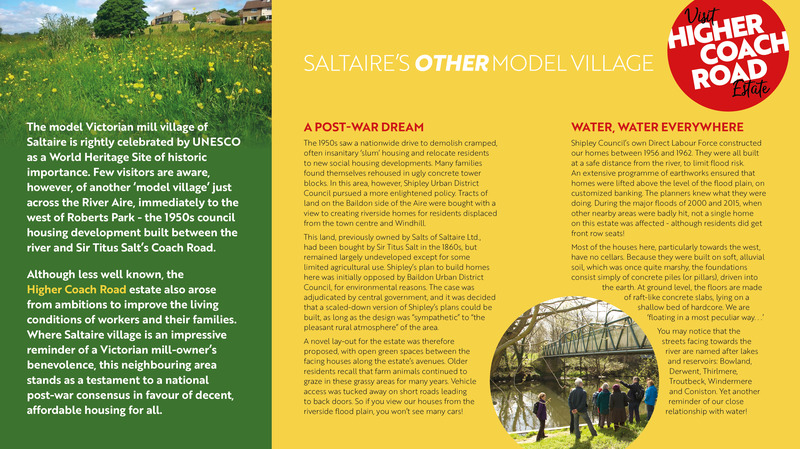 In this slightly-tongue-in-cheek “heritage” leaflet, which will also be available from Saltaire Visitor Information Centre, we wanted to make the case for this estate as “Saltaire’s Other Model Village” — a development planned to blend in with its green and pleasant environment, which residents still take great pride in. 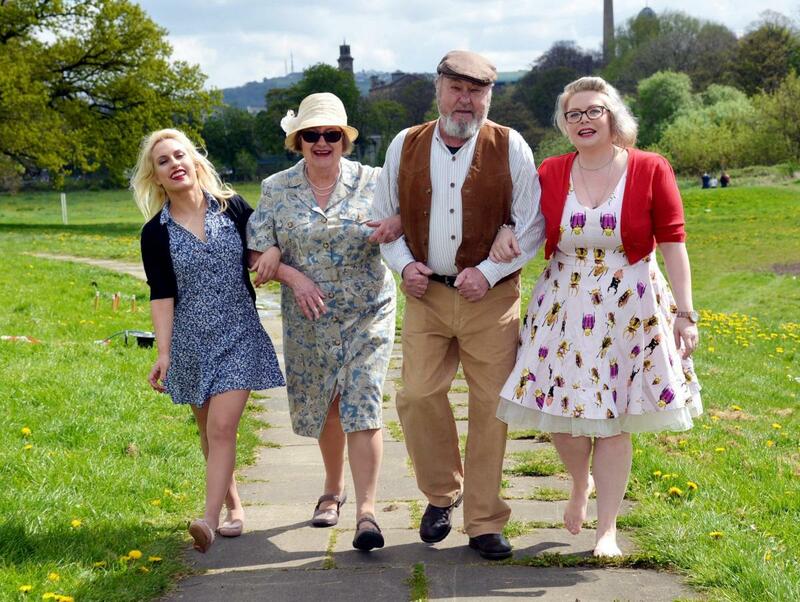 Here’s another of the shots from the T&A, with Saltaire’s towers visible in the background. Dressed in their versions of the 1950s are the current and recent chairs of the Higher Coach Road Residents’ Group — Pam Ruppe and Stewart Gledhill — who are flanked on either side by Kat Martin (left) and Lyze Dudley (right), both part of the Multi-Story Water team who dressed up for the day. Now, it does rather look from these pictures as if nobody else was there… which is not in the least bit true. I’ll post other shots from the day as soon as I have access to them. [editor’s note: sure enough, other pics can be found here and here]. 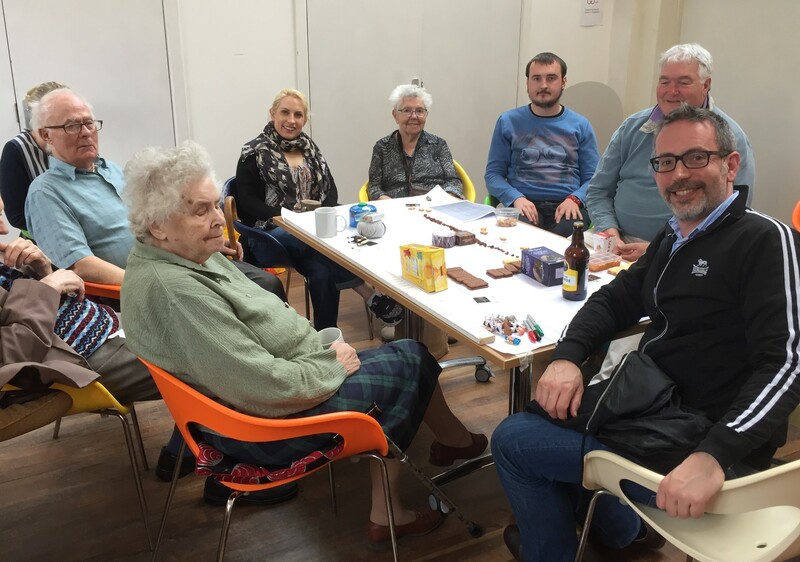 It was a perfect day for sitting out in the sun, for a chat with neighbours — whether enjoying food from the sandwich and cake stall masterminded by Irene Townend and other HCRRG members, or a little storytelling, or listening to music. 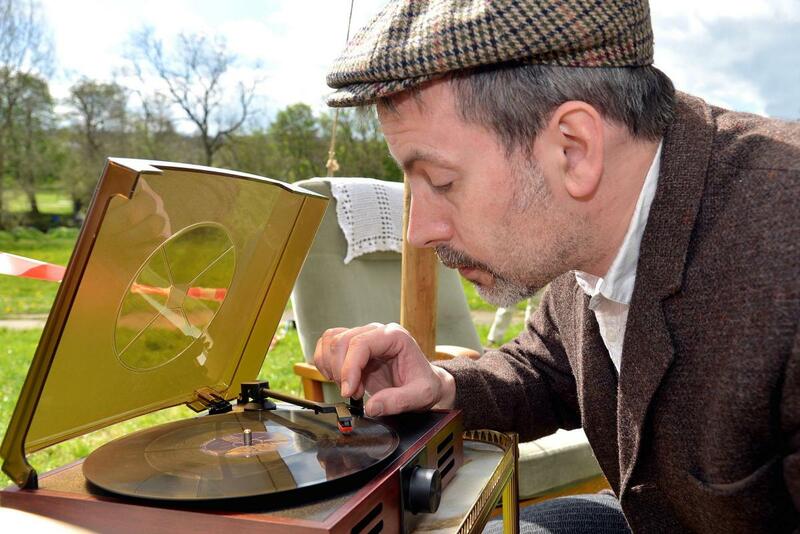 We had “the bard of Saltaire”, Eddie Lawler, playing live on his acoustic guitar, and also a collection of old 78 rpm records from the 1950s that we played on the little machine pictured below (with which I was asked to pose for the most embarrassing photo op of the afternoon…). The most popular tunes turned out to be Cliff Richard‘s “Please Don’t Tease” and Brian Hyland’s “Itsy Bitsy Teeny Weeny Yellow Polka Dot Bikini” (which several picnickers seemed to know word for word by heart, and sang along…). Admittedly both those tunes were actually released in 1960, but what’s a year between friends? This is when a lot of people would have been moving onto the estate anyway: construction began in 1957, but continued until the early 60s. That’s Barry in the middle of the shot above. He grew up in Dockfield, and has lived on Higher Coach Road since the 60s. He contributed some great new additions to the collection of memories we’ve been gathering around this little play. And on the right in the image below is Steve, one of the most active current members of HCRRG, who went straight off from Salts to visit one of the older residents on the estate — as part of a “befriending” scheme that the group has started, to tackle the problem of isolation experienced by some. HCRRG is doing some amazing work now… I salute you all. 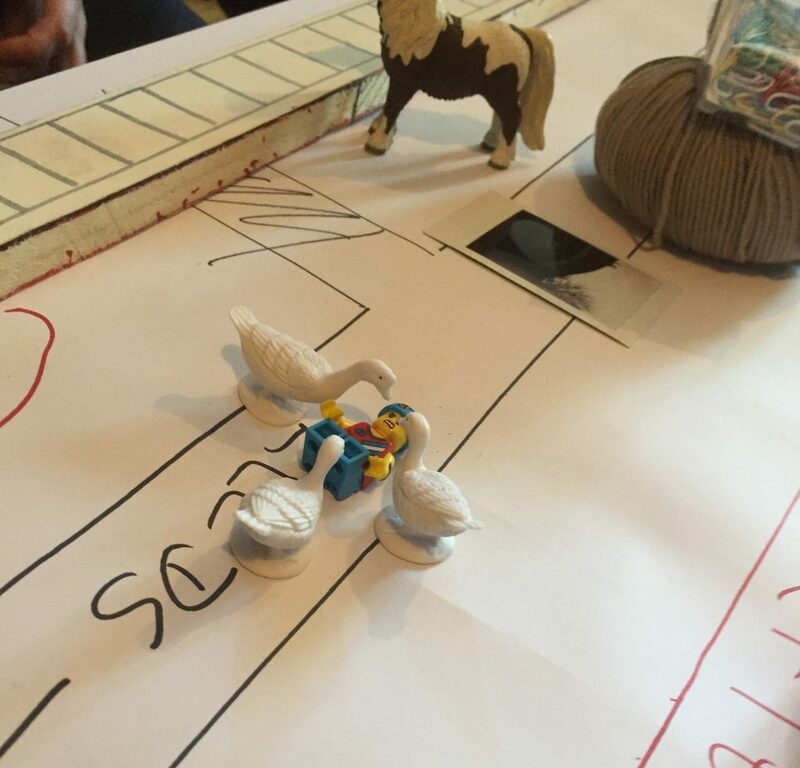 A particular highlight for me of this last performance was the way that the audience took it upon themselves to animate some of our table props… Below is one spectator’s interpretation of a story Kat tells, at the end of the piece, about canoeists being attacked by swans on the canal outside the Amber Wharf flats… So OK, it’s geese not swans, and a skateboarding lego man not a canoeist, but that is the spirit of improvisation! 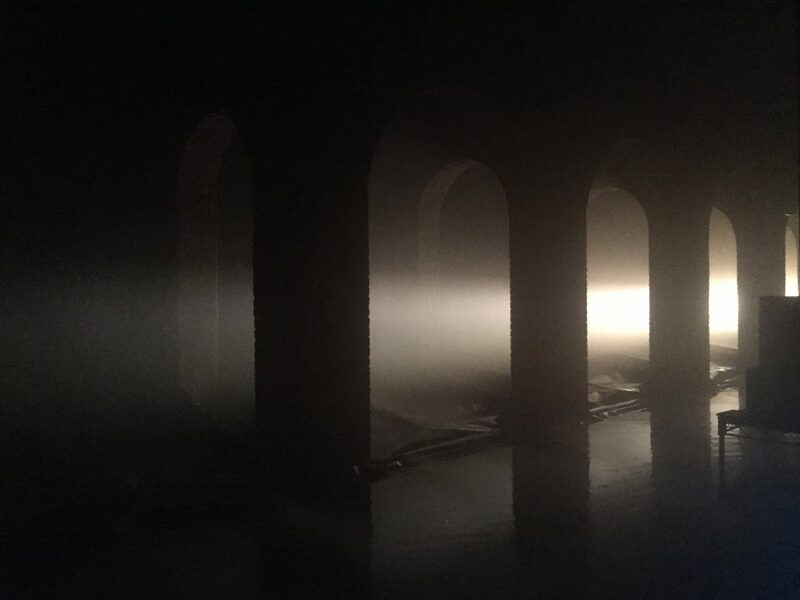 This was the scene just last night, in one of the flats at Amber Wharf. 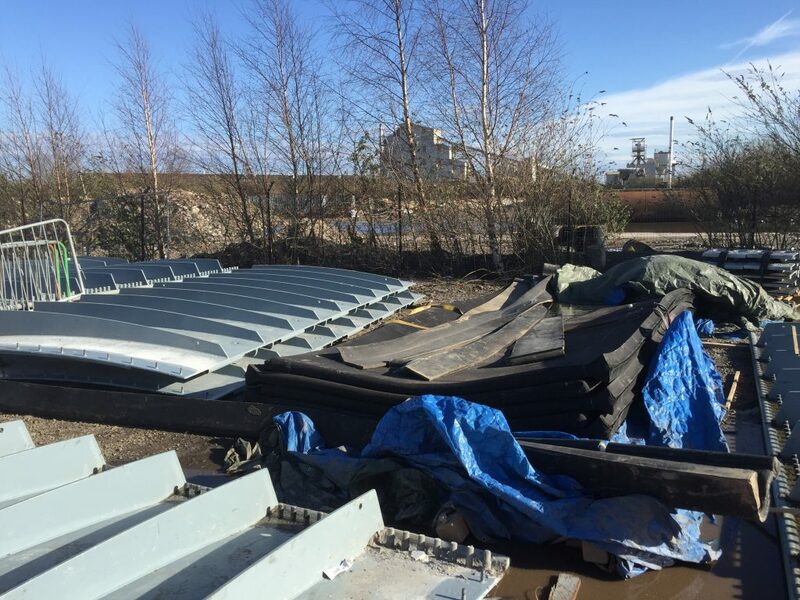 That’s the new-build properties next to the canal, in the Dockfield area of Shipley. Sitting at the end of the table is Kat Martin, my co-performer in This Island’s Mine, the two-person play that we’ve devised and written about the history of Dockfield, and the close relationship that industry and residents have always had here with the River Aire, the Bradford Beck, and the Leeds-Liverpool Canal. 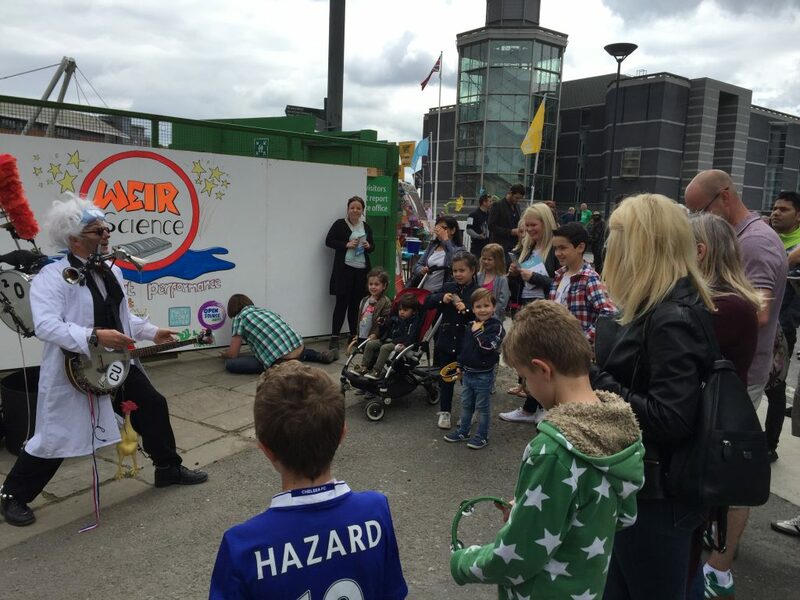 This was the latest in a series of performances we’ve been giving in homes and pubs/clubs over the last week or so. This particular flat overlooks what was once the junction of the Leeds-Liverpool and Bradford Canals. That’s Junction Bridge, built in 1774 at the same time as these sections of the canal network, to allow horses to get across from one tow-path to the other. This junction features prominently in our story, during the play, and it’s been one of the fun things, in performing it, to be able to point directly to where we are “on the map” as we speak. We’re talking about places and things that our audiences know well, but bringing a different perspective to them. So far, the reactions have been great! 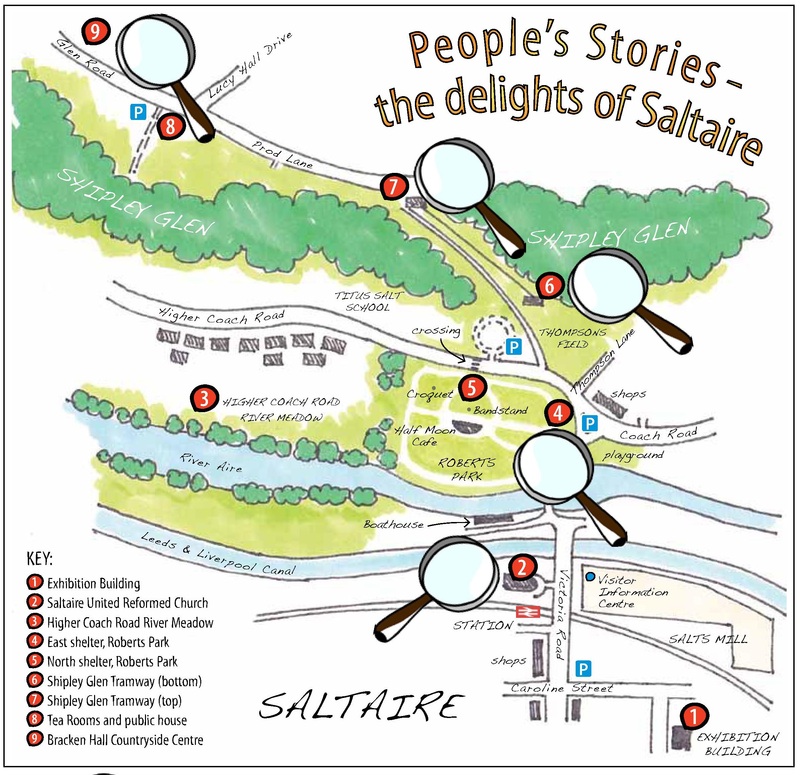 One of the key locations on our map is Saltaire Brewery, whose main buildings were built as an electricity works for Shipley Council at the beginning of the 20th Century (later nationalised under Yorkshire Electricity Board). 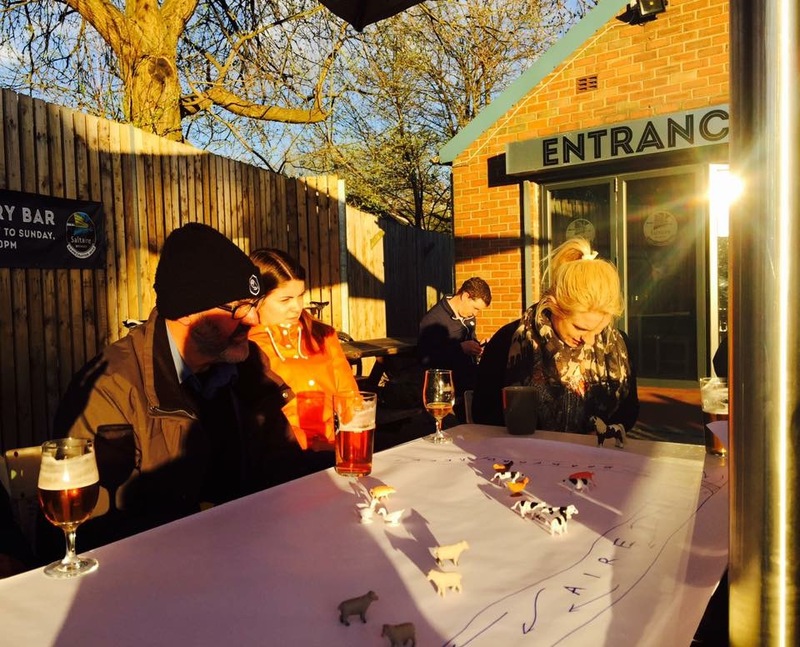 We were privileged last week to present a public performance of the play in the beer yard outside the Brewery Tap — on a gorgeous April evening in the setting sun (which kept everyone just warm enough!). 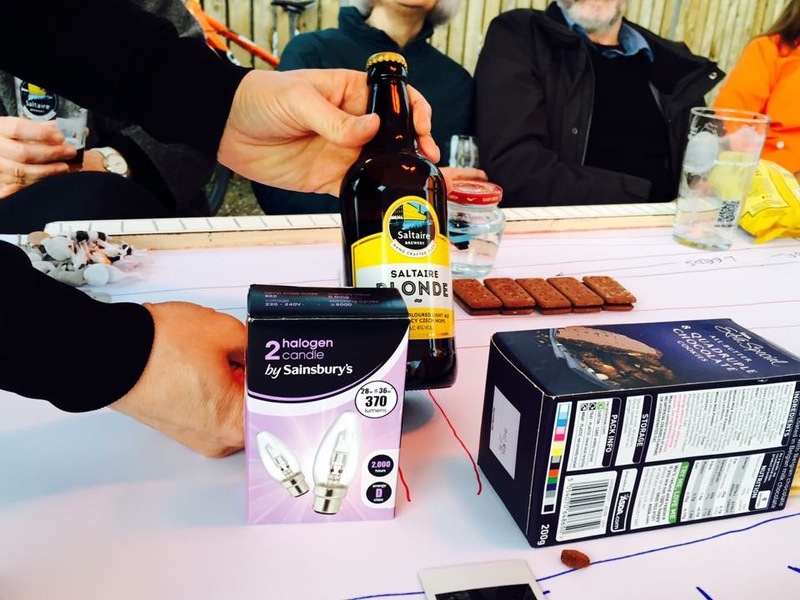 … at the moment when we talk about how the former electricity works (represented by the light bulbs) is now the Brewery (represented by the bottle of Blonde). 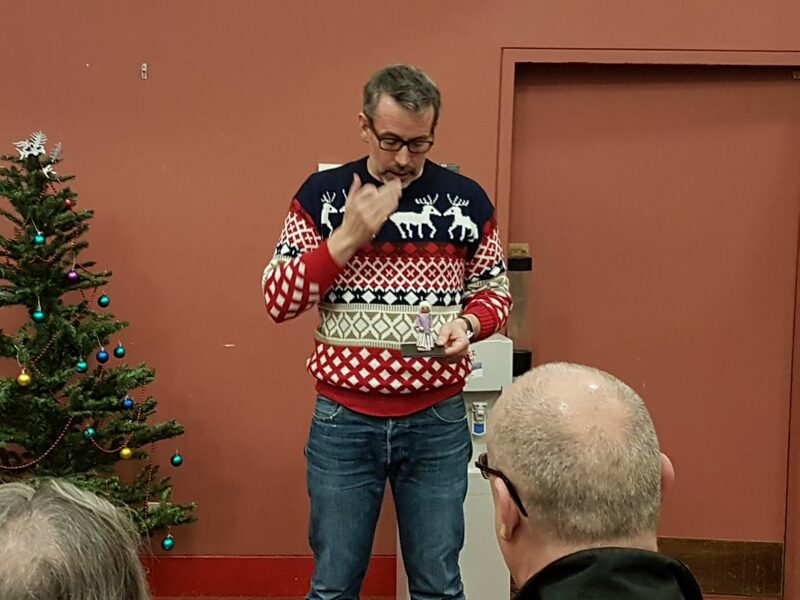 I actually had to pause mid-performance for a moment while Janet took the picture — much to everyone’s amusement. 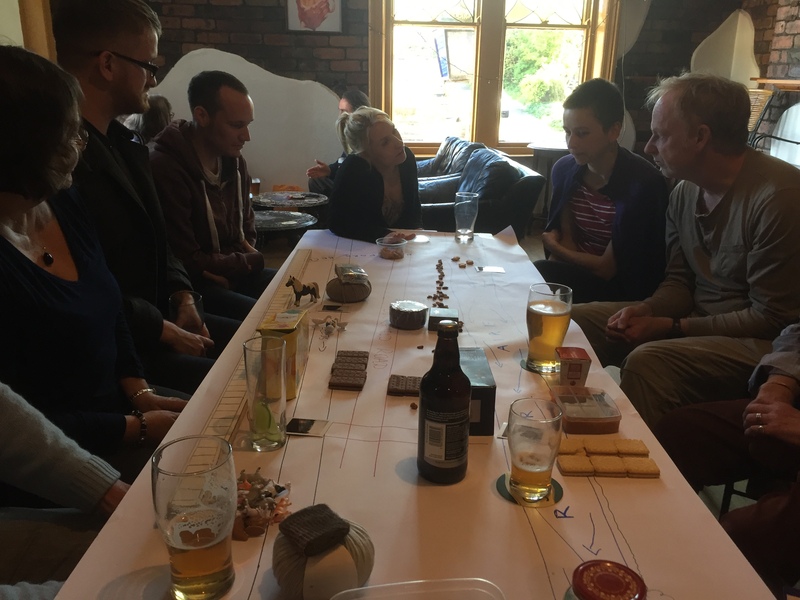 But that’s one of the nice things about the informal, round-the-table set-up for this play… there is a script we’re following, but people can also interrupt, ask questions, make observations, and we try to improvise satisfactory responses. 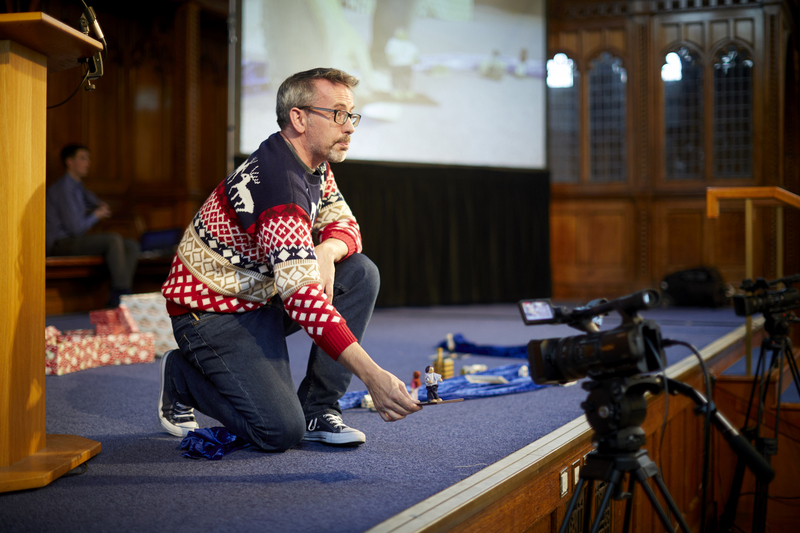 It gives the show a lovely sense of liveness and one-off-ness every time we do it. Geoff worked for decades in water quality control — for Yorkshire Water and its predecessors — and following our tales of Dockfield’s sewage works and plumbing, he told us how his very first work assignment, as a new employee in 1973, was to visit the pumping station next to the footbridge at the bottom of Dock Lane (again – very much part of our map!) in order to remedy a fault. It was quite the trip down memory lane. 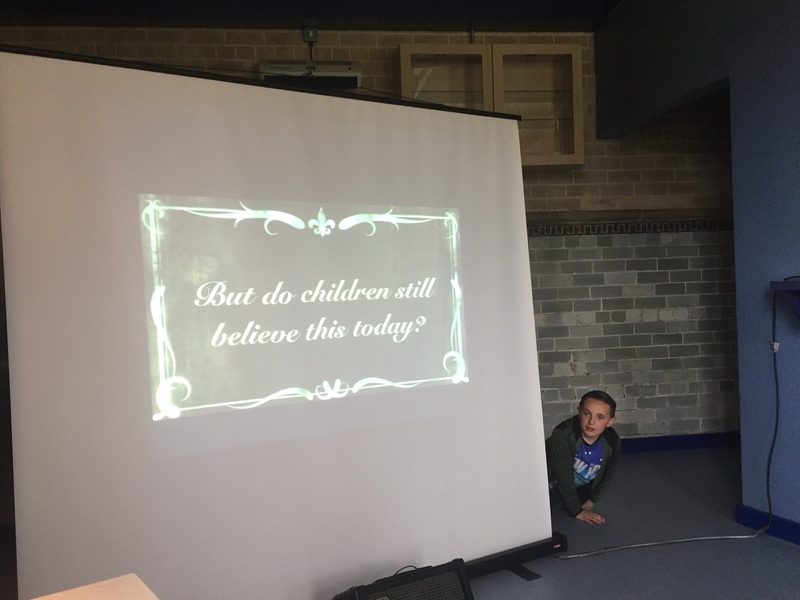 This performance at Shipley’s Kirkgate Centre was also attended by some with even longer memories, who told tales of Shipley and Bradford in childhoods before World War II. What I’m really proud about with this play, so far, is that it seems to “work” in different ways for different audiences. For these people at Woodbottom Club, it provided an opportunity to look back and remember together — they carried on talking for hours (literally) after the performance, but were still thanking us for this “special evening” when they left. 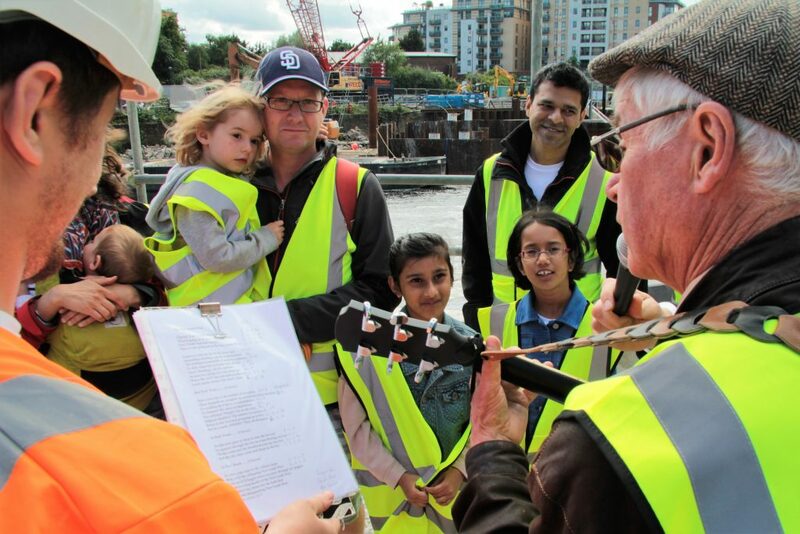 Conversely, our hosts last night at Amber Wharf are relatively new arrivals in Dockfield, and so the play helped to ground them in the history of the place and answer some of the questions they had about it. In the end, I suppose, that’s the great thing about storytelling… a story has a shape of its own, but it can mean different things to every spectator, depending on the interests and experiences they bring to it. Postscript. 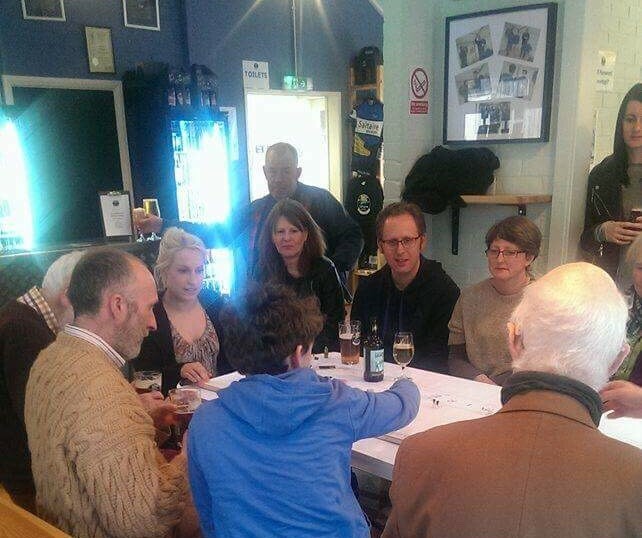 This was tonight’s performance — Wednesday April 19th — at Saltaire Brewery Tap. 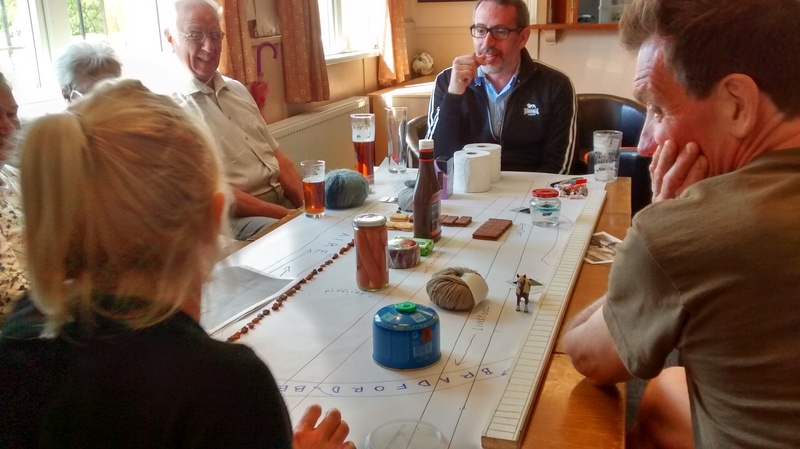 This week we came inside (no setting sun to warm us this time), and were joined by the biggest and most diverse audience we’ve had yet… Diverse in terms of both age and background. 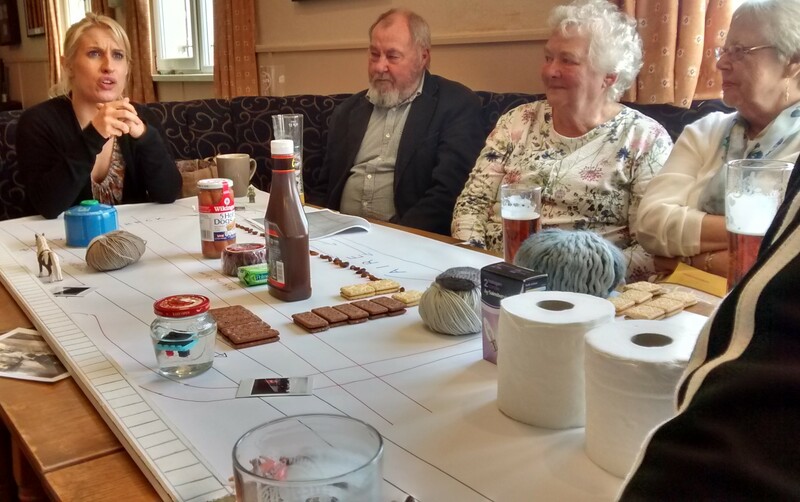 Gathered in two rows around our table, they included long-term Dockfield residents, more recent arrivals, and visitors from right out of town! Indeed, among those present were a family from the Midlands… theatre and cinema enthusiasts who had come up to see the “magic lantern” collection at the Bradford Media Museum (an old-fashioned form of colour slide projection), only to discover that the collection has been shunted off down to London. 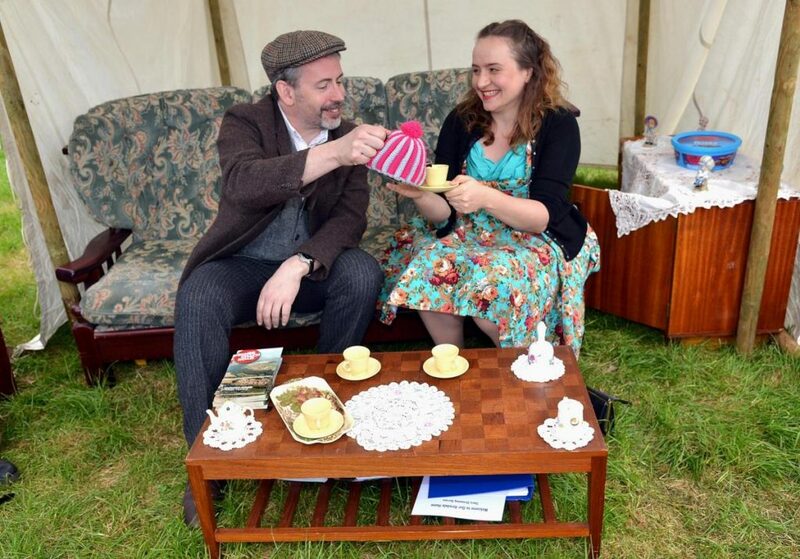 They seemed delighted by our show, though (as if reassured that the North had managed to keep some culture of its own!). 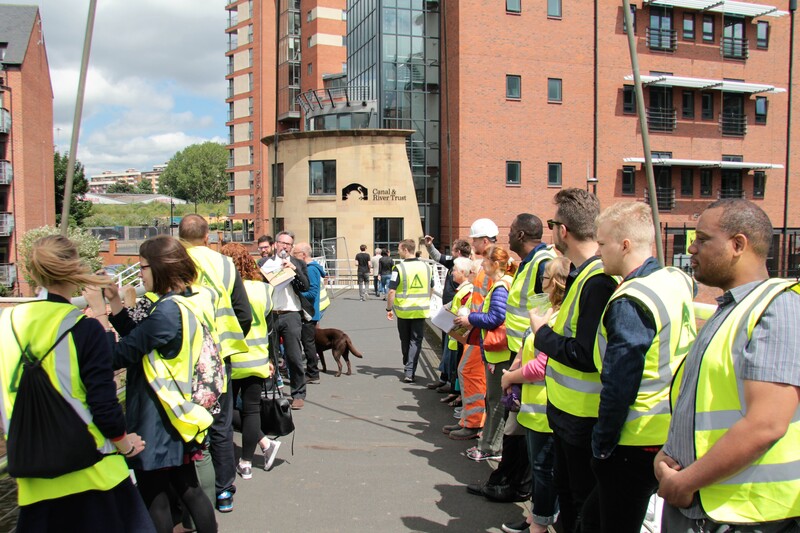 Despite knowing nothing about the Shipley area, they said that the history of industrialisation — that we tell through the microcosm of Dockfield’s story — was one they very much recognised from their own Black Country background. “You’ve invented a new paradigm”, one of them told me afterwards. I confessed to not knowing what he meant. “A new model for doing plays,” he explained. 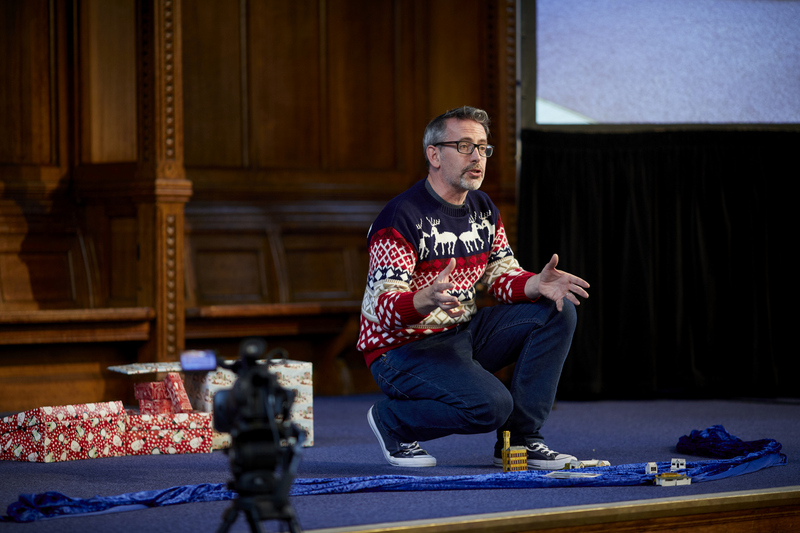 “You could take this format and tell the story of anywhere.” And I suppose you could… Personally, I wouldn’t claim to any enormous originality in the format of this piece: the component parts come from a range of theatre forms. But it’s true I haven’t seen them combined in quite this way before, or for quite this purpose (telling the up-close story of a place, through the use of characters, rather than the story of characters, that’s set in a place). As I say, though, what’s most special to me about this piece is the way that it seems to invite such spontaneous, conversational responses — even as we’re performing it. 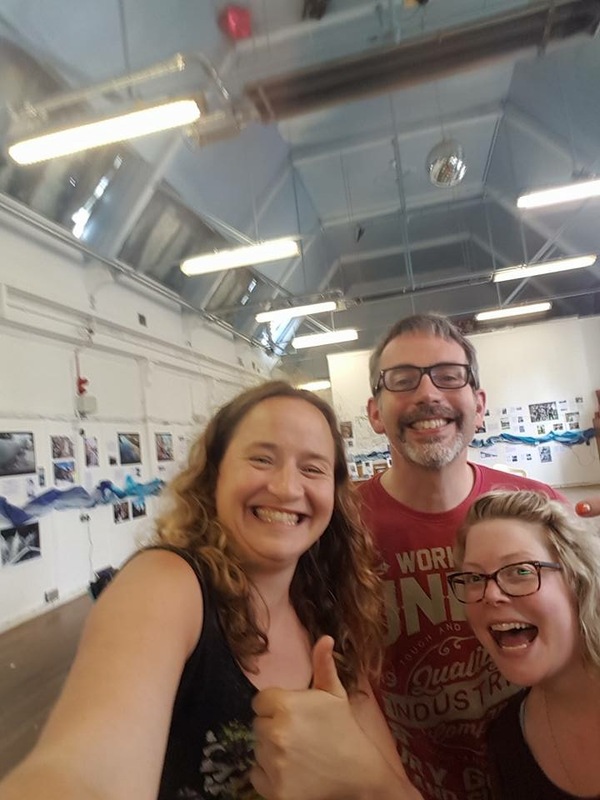 Acknowledgements: Special thanks are due to Kat Martin, my wonderful co-performer in this piece, and to Simon Brewis – our director, who also guided us skilfully through the play’s development phase, from my initial draft script. Simon also took the pics of the Woodbottom performance. 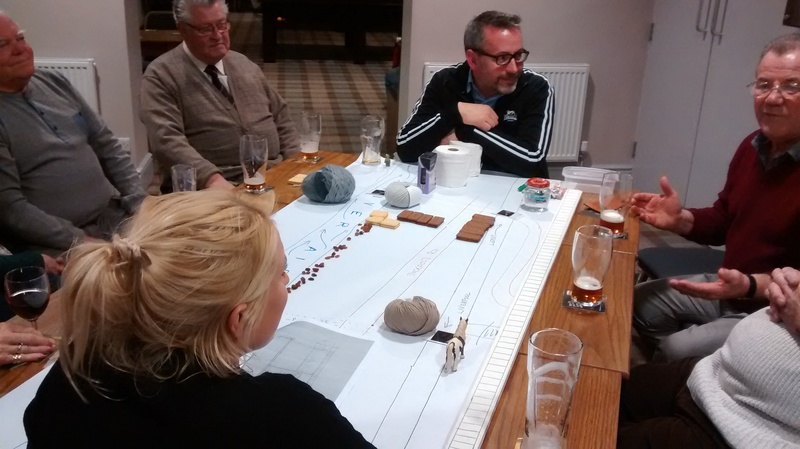 Thanks also Janet Wojtkow (whose pics I pinched off our Facebook feed, where she’d uploaded them), Paul Barrett (for the Kirkgate Centre pic), and Ruth Bartlett (for tonight’s Brewery pics). Please note: this is an intimate performance designed for small audiences. You are welcome to just turn up, but if you would like to ensure a spot for one of these performances, please call or text Steve at 07504 417323. Alternatively, we can arrange another time/date/place to suit you! We’re taking this as it comes and trying to respond to audience interest as it arises. Dreams coming true at Higher Coach Road! Happy New Year: Beck to the Future?